Download hundreds of Keynote templates, and many other design elements, with a monthly Envato Elements membership. 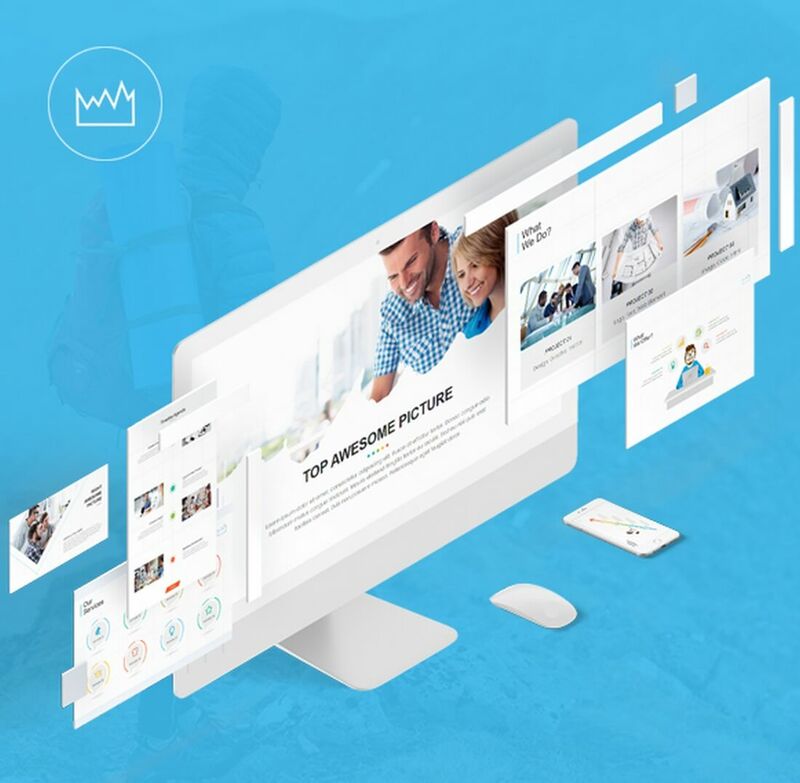 It starts at $16 per month, and gives you unlimited access to a growing library of over 650,000 photos, graphics, templates, and more. Download anything, any time, as often as you need! 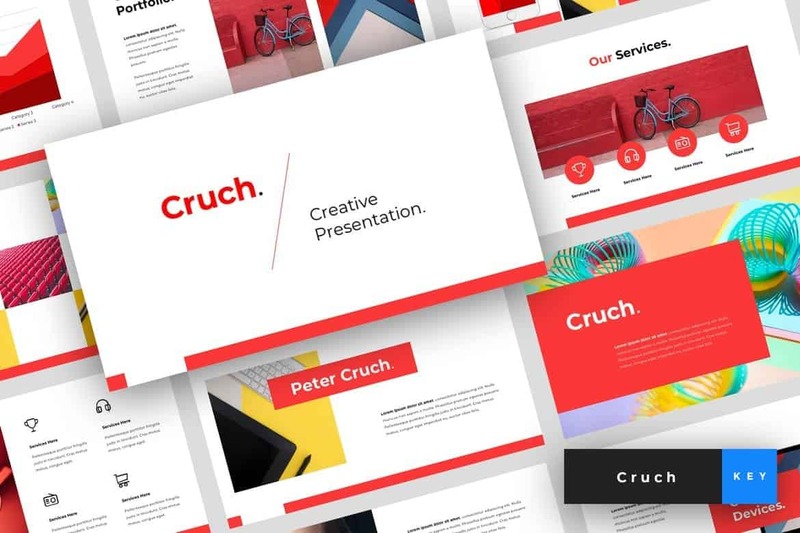 Cruch is a modern and creative Keynote presentation template featuring a clean and professional design. The template comes with 30 unique slides with resizable graphics, vector icons, image placeholders, and much more. 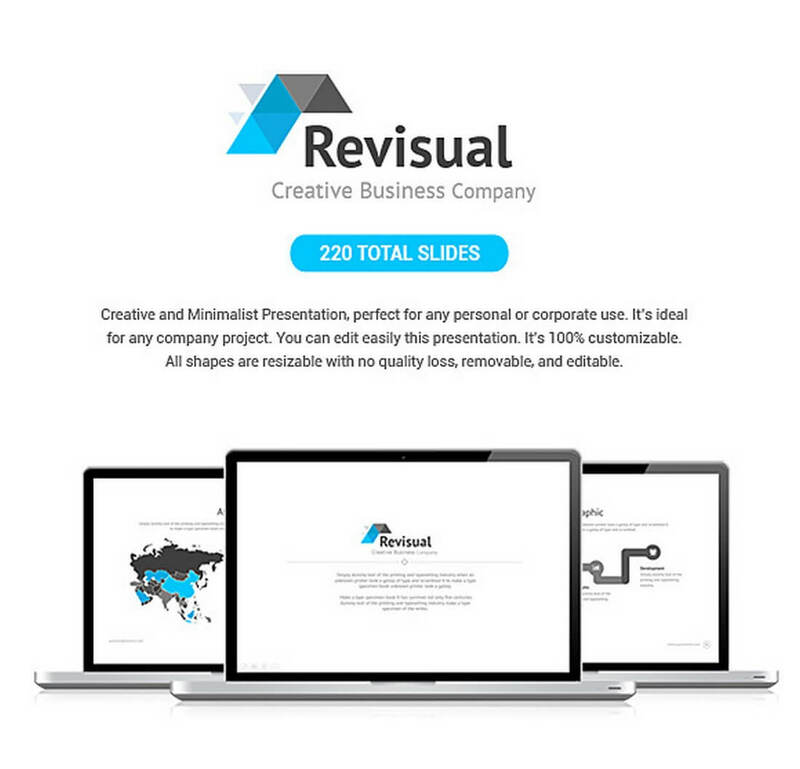 It’s perfect for making creative agency, business, and corporate presentations. Highlight is a colorful Keynote template that comes with creative slide designs filled with colors. 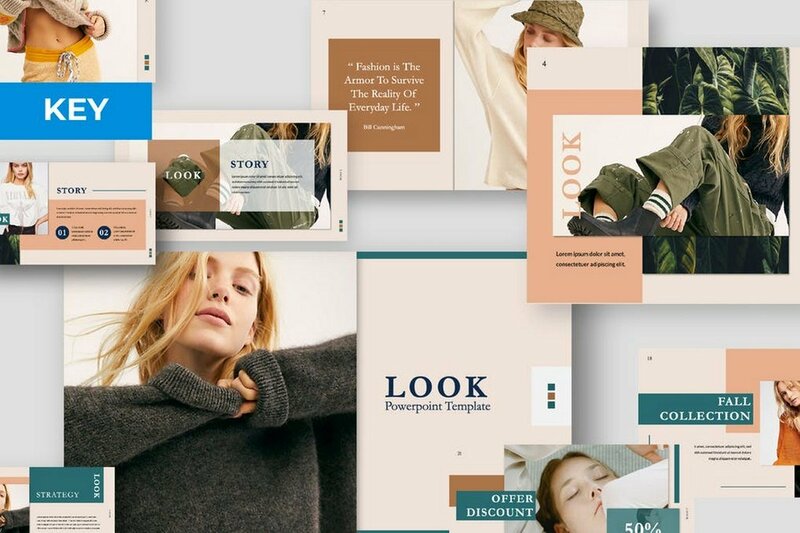 You can use this template to make all kinds of fashion, photography, and branding related presentations. The template also includes unique portfolio slides, editable vector graphics, image placeholders, and more. Keton Keynote template features a clean and minimal design. It also includes a creative line-based design style throughout its slide design. The template comes with 50 unique slides with 3D vector infographics, icons, customizable color options, and other elements. 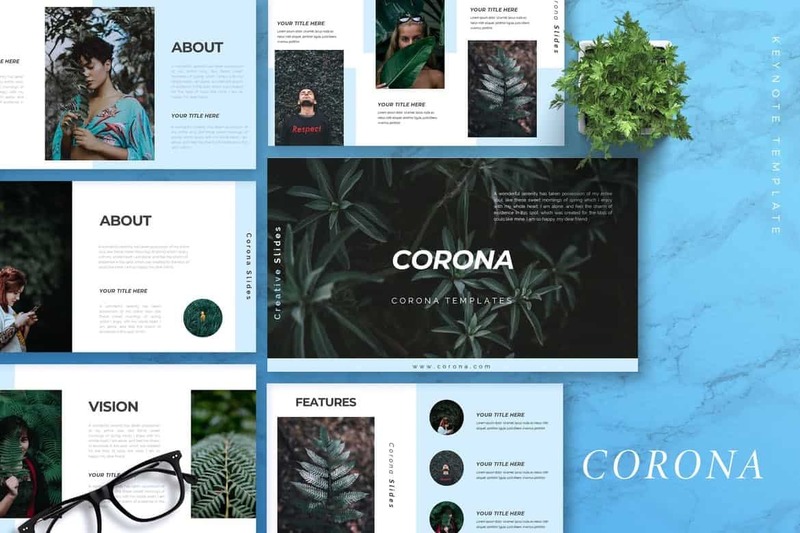 Corona comes with a modern design that allows you to capture the audience’s attention with lots of image-based content slides. 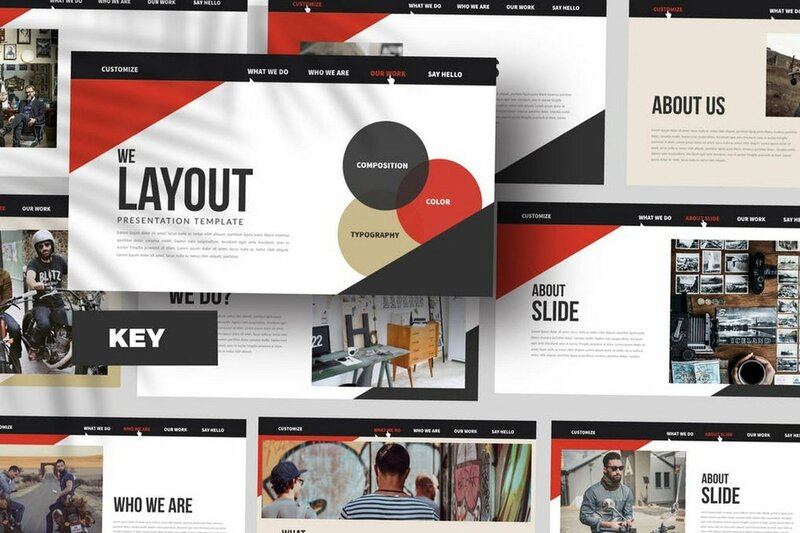 The template comes with 30 unique slides that are available in 5 different color schemes. It also includes image placeholders for easier editing. 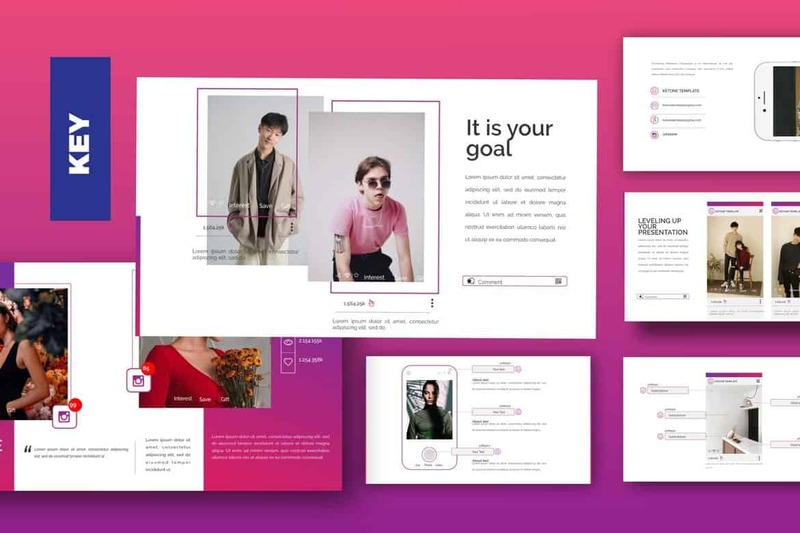 This colorful and attractive Keynote template is designed specifically for making fashion catalog and creative portfolio presentations. It features unique slides with editable colors and vector graphics. The template is also available in Full HD resolution. 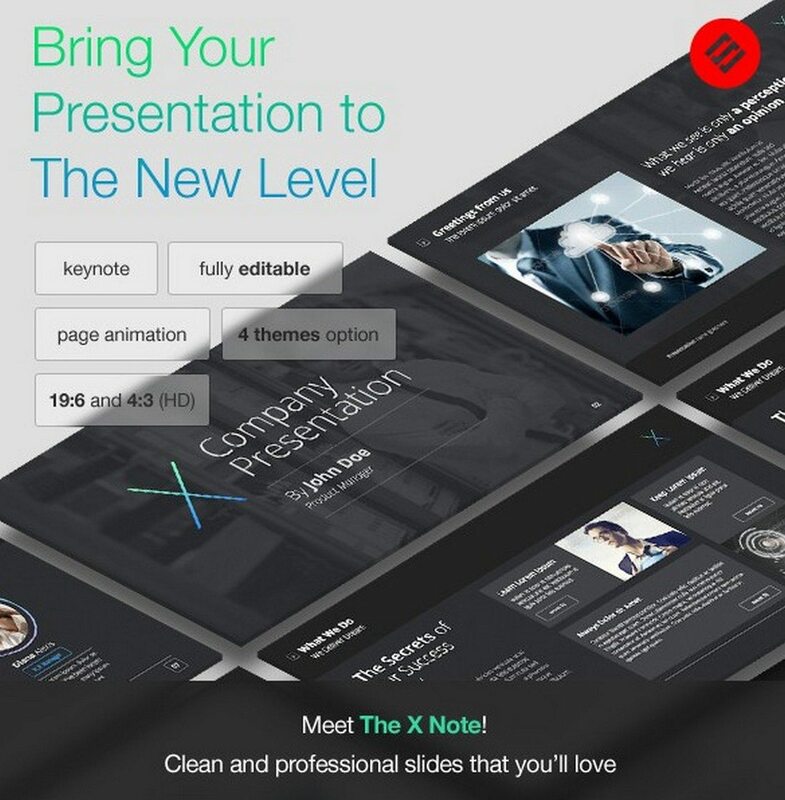 Note is a minimalist Keynote template that features a modern and creative design. 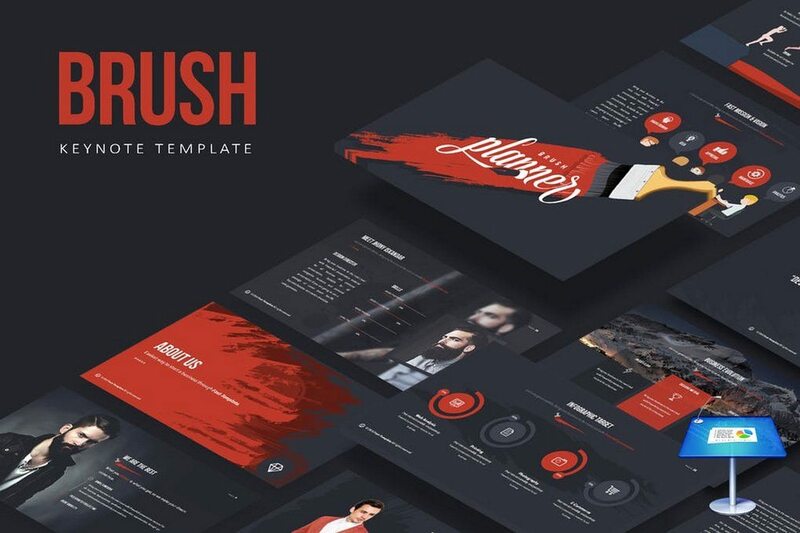 The template comes with 30 unique slides in 5 different color schemes. The slides in this template also include multipurpose designs, which will allow you to make many different types of presentations. 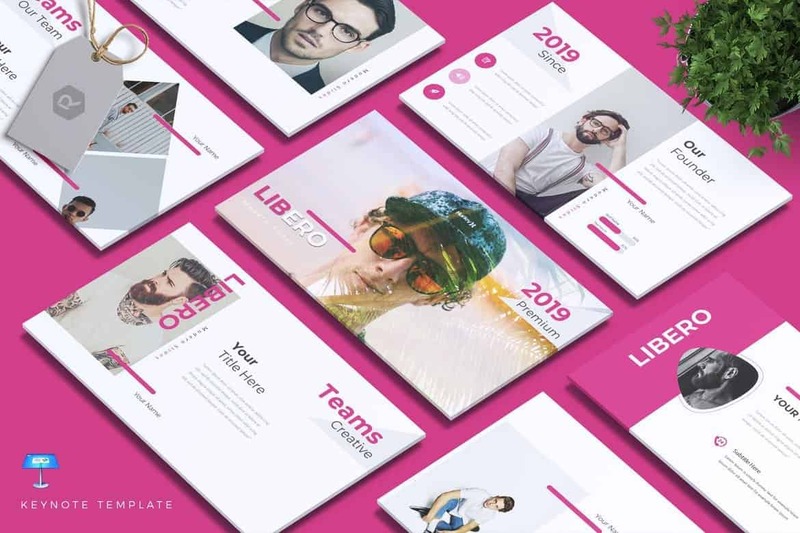 Libero is an attractive Keynote template for making modern portfolio and business showcase presentations. 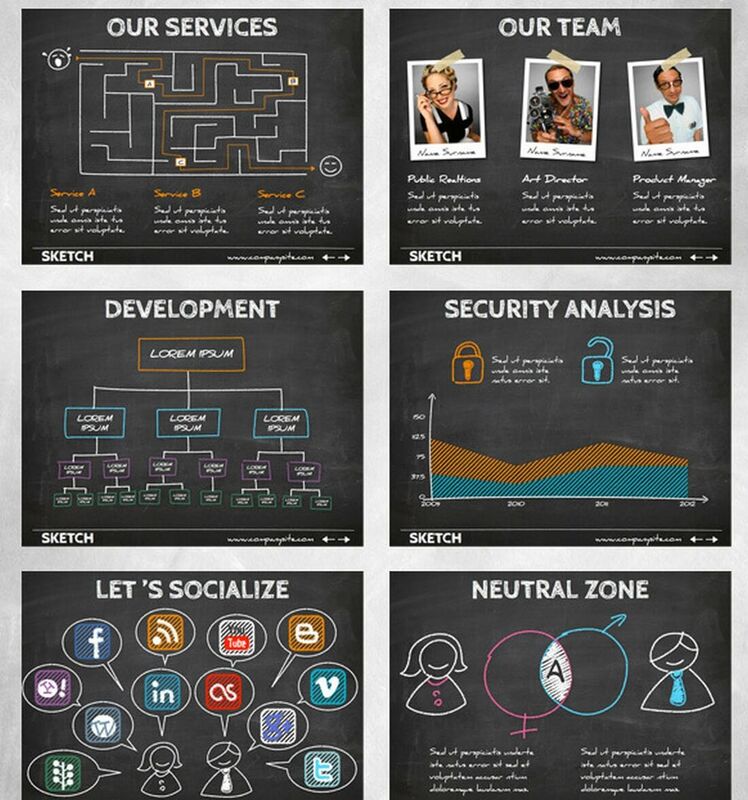 The template includes 30 unique slides with infographics, vector graphics, icons, image placeholders, and much more. 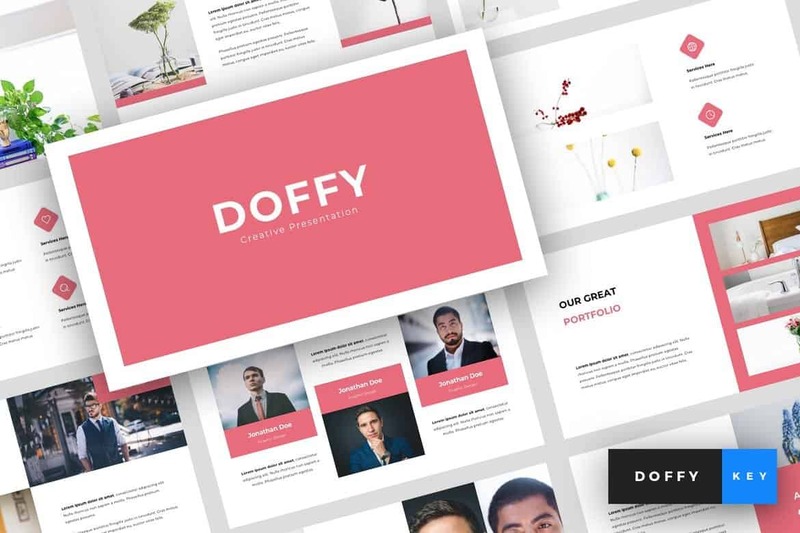 Doffy is a clean and professional Keynote presentation template you can use to design agency, startup, and creative business presentation slideshows. It comes with 30 unique slides with resizable vector graphics and drag and drop editing. 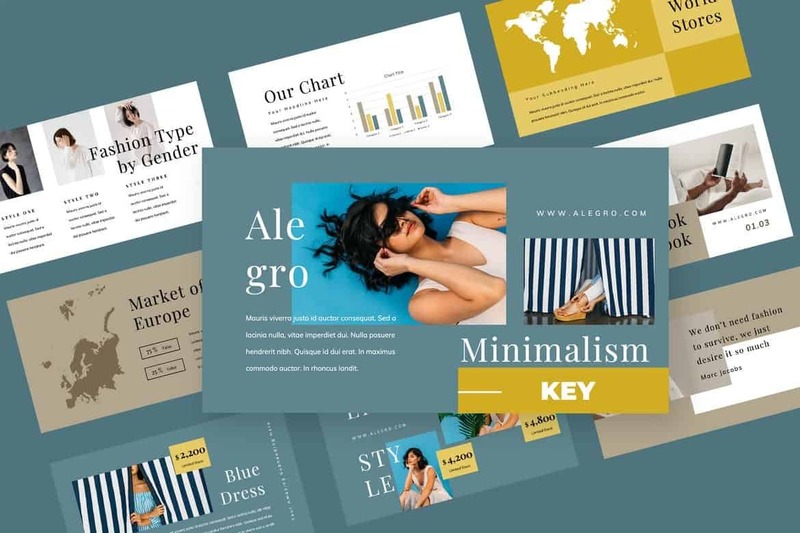 Alegro Keynote template is the perfect template for designing slideshows for modern fashion catalog, photography, and design-related presentations. The template includes more than 50 unique slides. 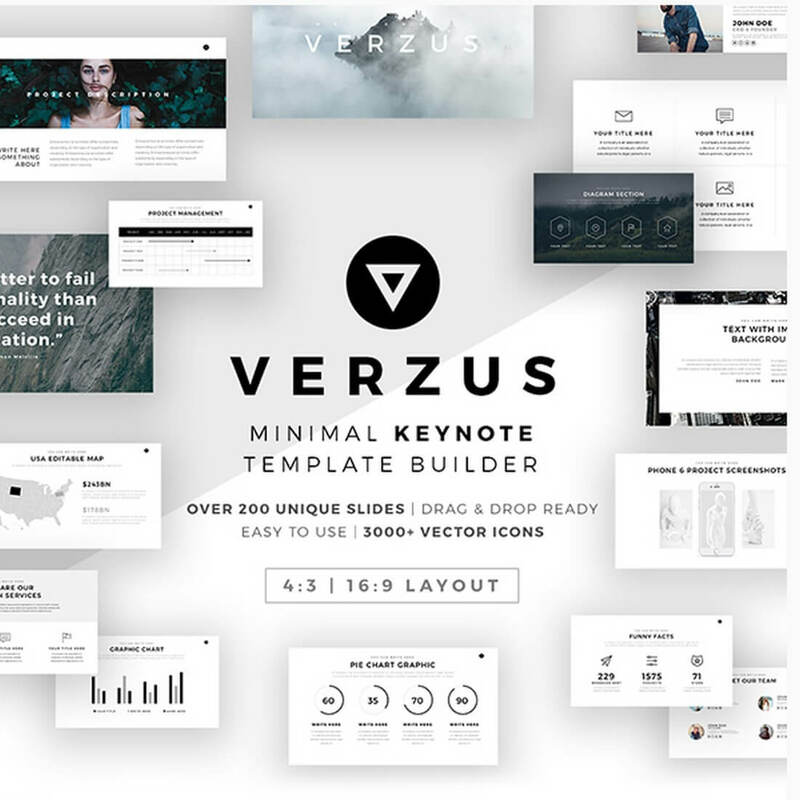 This minimalist Keynote template includes more than 150 slides with clean and professional designs. 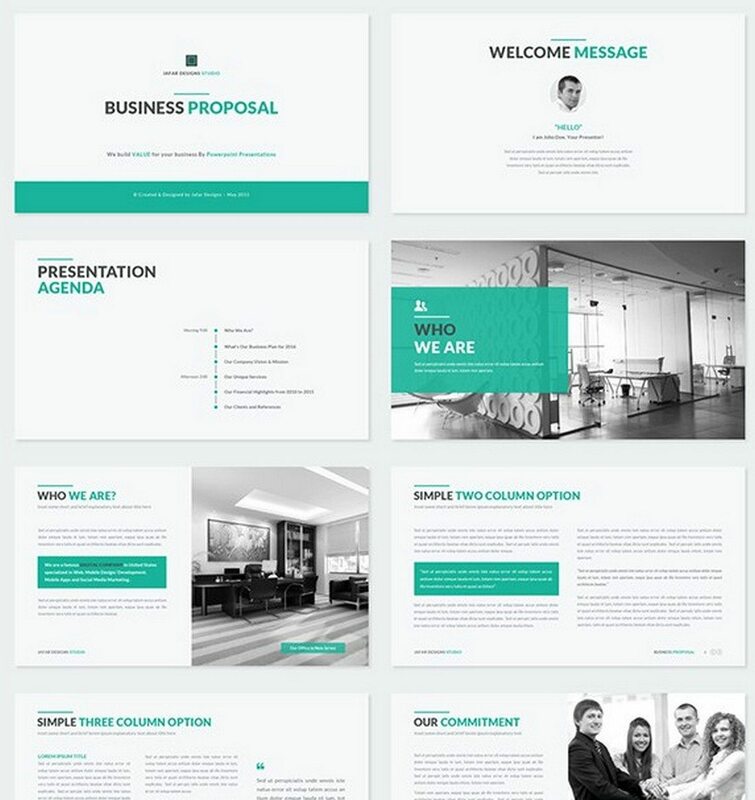 You can use this template to design presentations for startups and modern businesses. it ‘s also available in 5 pre-made color schemes as well. 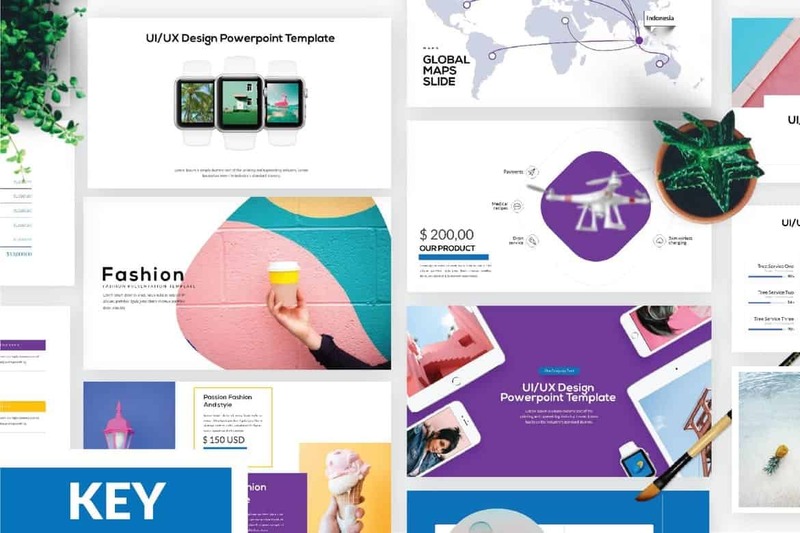 Look is a modern Keynote template that comes with a colorful slide design filled with lots of images. The template features an easily customizable design and includes image placeholders, predefined text styles, and editable colors. 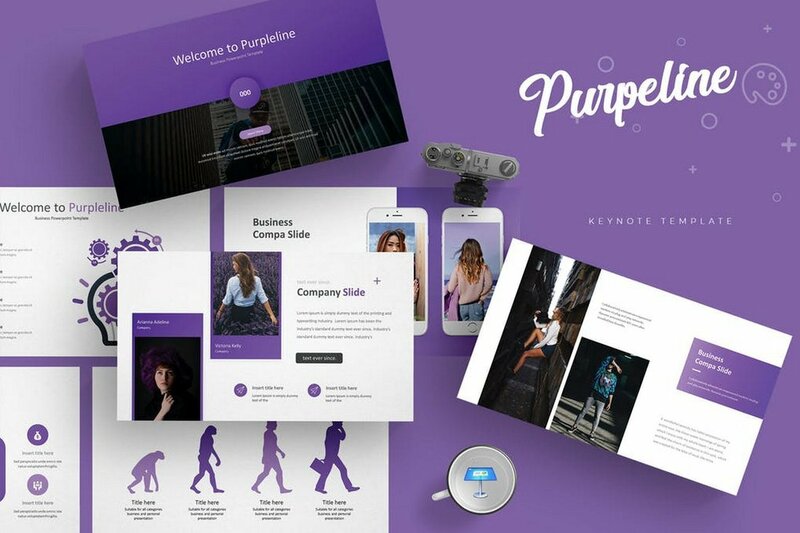 Purpleline Keynote template features an attractive and professional design that takes full advantage of bright colors and shapes. 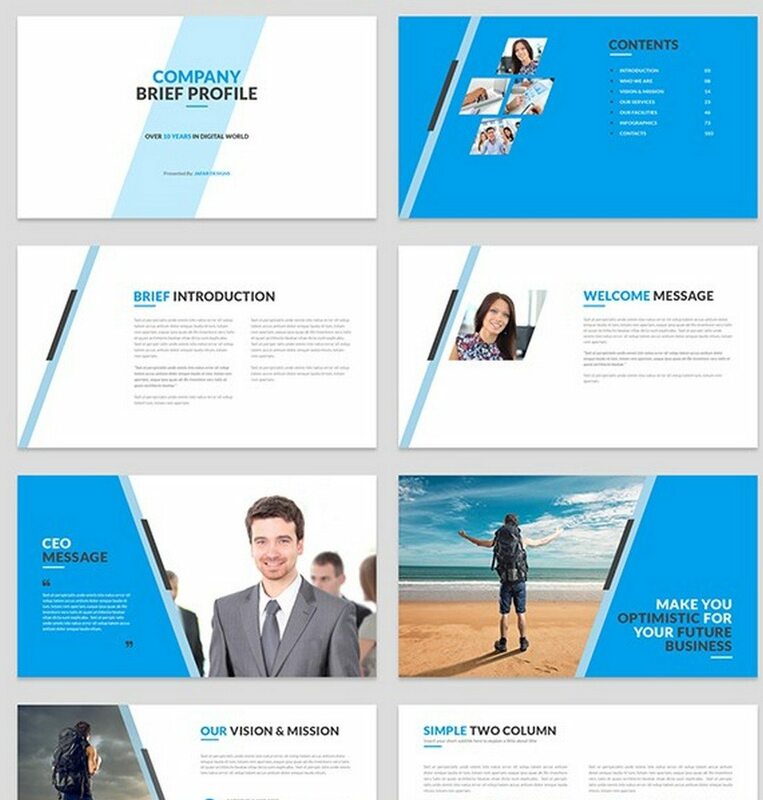 The template comes with a total of 150 slides, featuring 30 unique slides in 5 different color schemes. RITS is a minimal Keynote template that also utilizes a lot of visuals to convey your message effectively in each slide. It includes image placeholders, editable vectors, changeable colors, and much more. Creative Agency is a modern Keynote template you can use to craft presentations for marketing, business, sales, and startup related events. 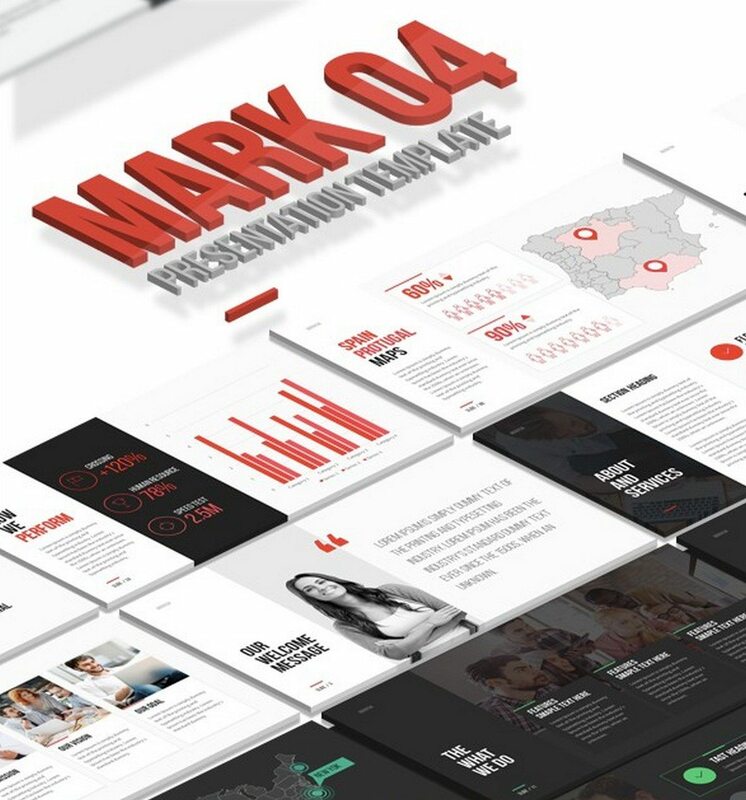 The template comes with 50 unique slides with 3D infographics, charts, graphs, and much more. 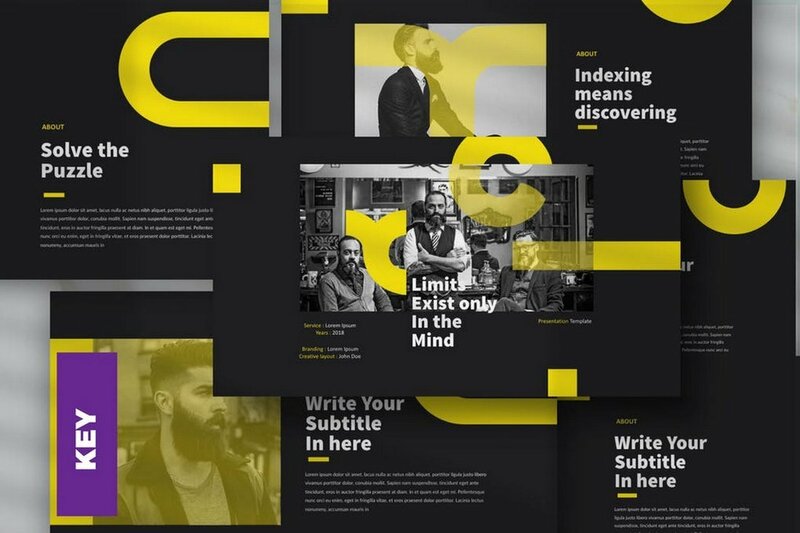 Boeotian is a unique Keynote that features an attractive dark color theme, which effectively highlights the content. However, the colors can be easily changed to your preference as well. It comes with 50 unique slides. 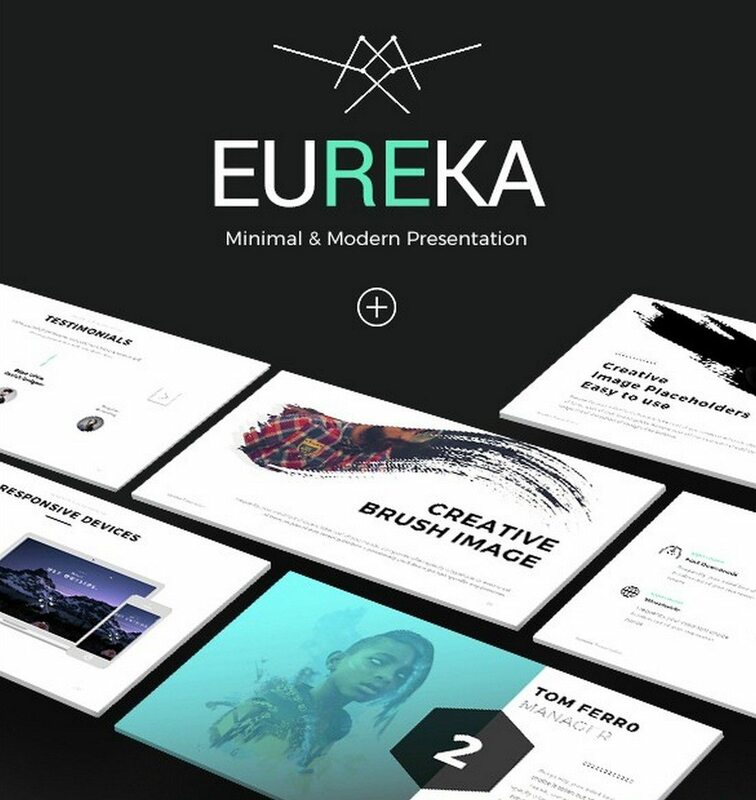 Minimal Layout has a creative set of slides with modern and minimalist designs. 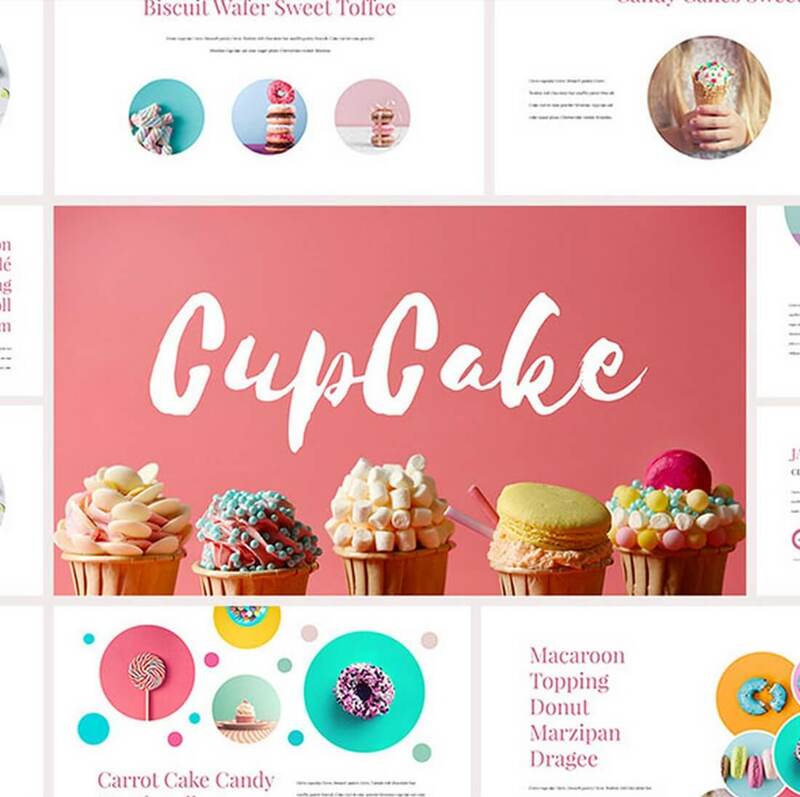 The template comes with 50 unique slides featuring editable colors, icons, infographics, and more. 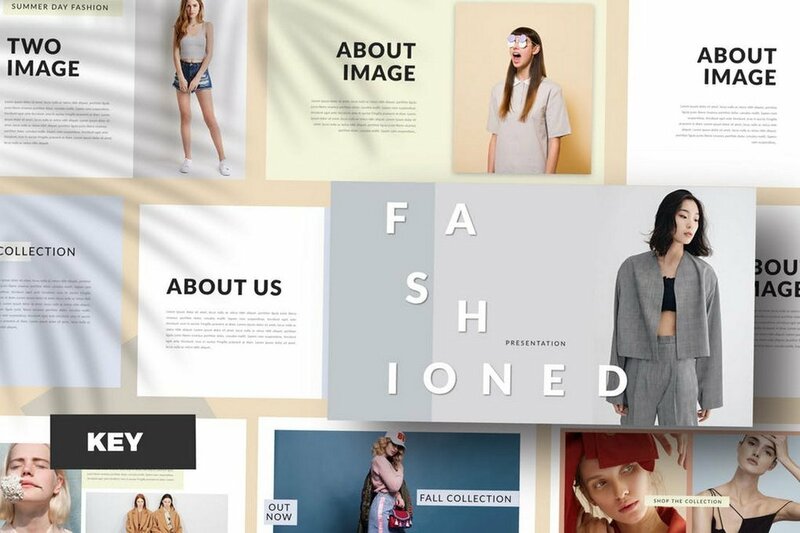 Model is a highly visual Keynote template that’s most suitable for creating slideshows for fashion, apparel, and photography related presentations. 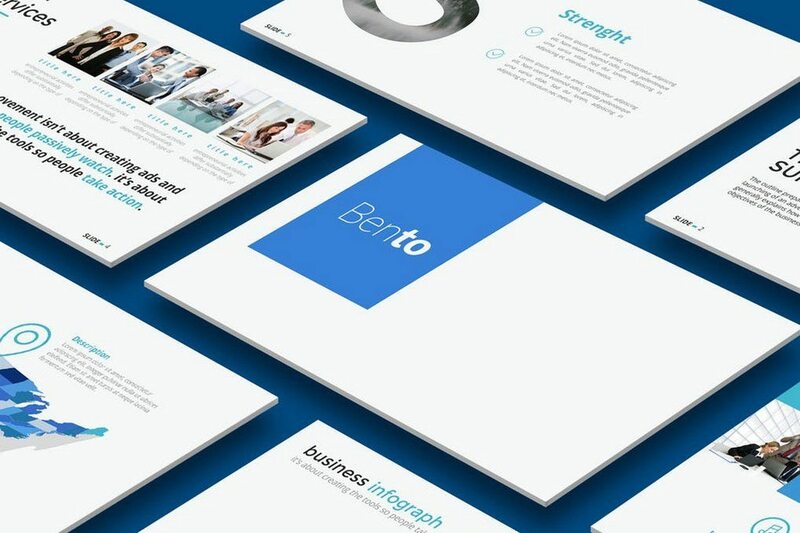 It includes more than 50 unique slides with image placeholders and customizable design elements. 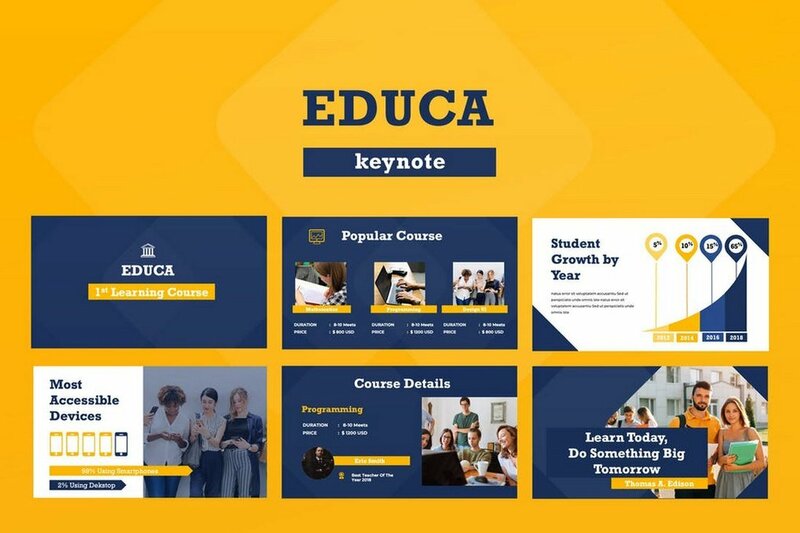 Educa is a great Keynote template ideal for colleges, schools, and education related businesses for creating powerful presentations. The template comes with 50 unique slides featuring free fonts, 500 icons, mockups, and much more. 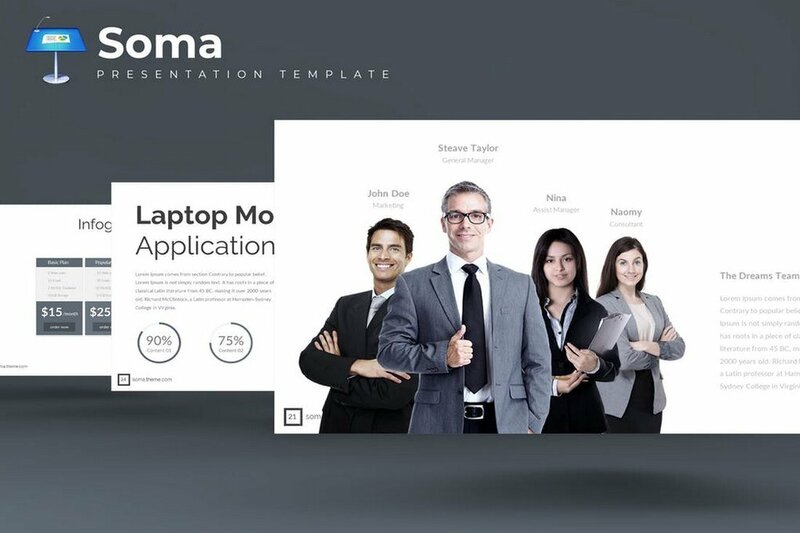 Soma is a minimalist Keynote template designed for making slideshows for business presentations. 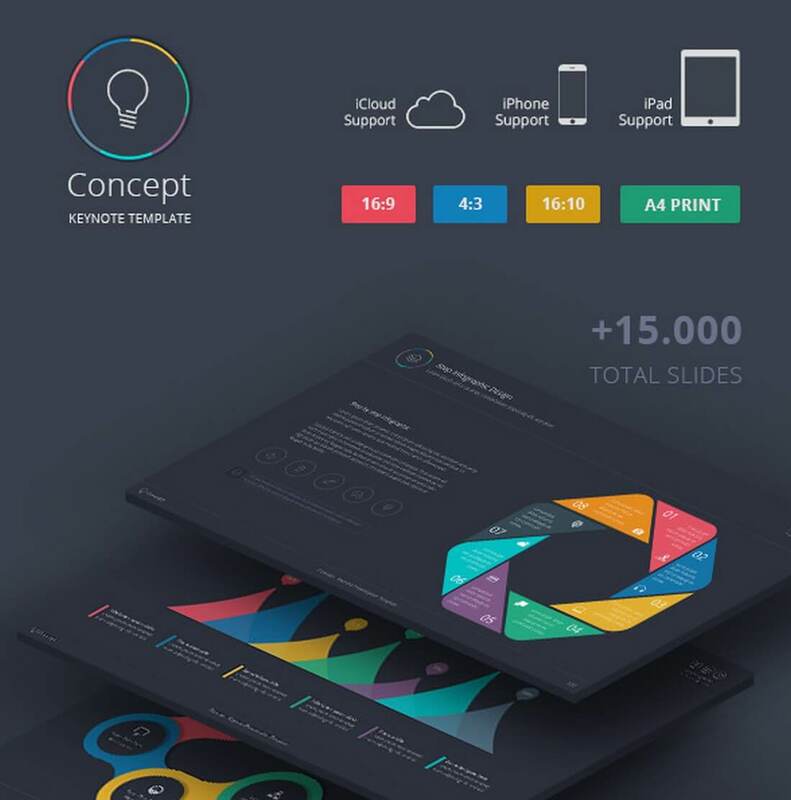 The template includes 30 unique slides in 5 different color schemes. 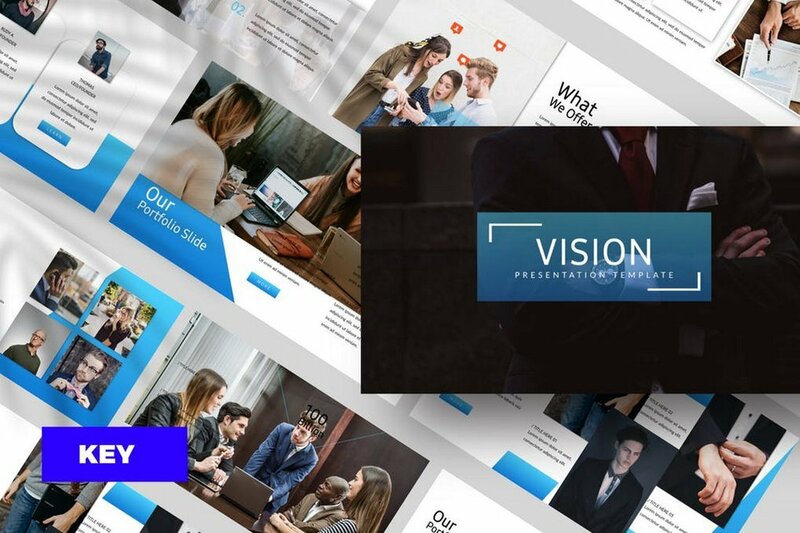 Vision is the perfect Keynote template you can use to craft an effective presentation for corporate businesses. It includes 50 unique slides featuring charts, graphs, infographics, and lots of other useful vector graphics. 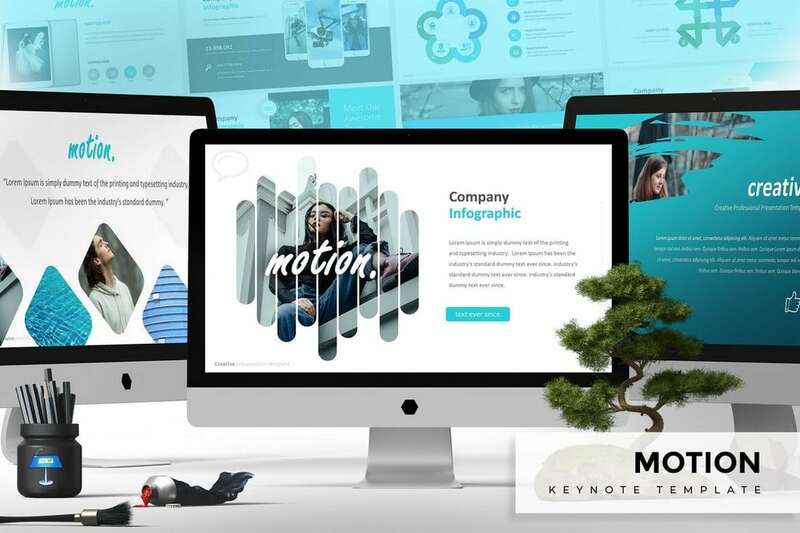 Motion is a modern Keynote template with a creative design. The template features a highly visual design filled with colorful graphics, images, and effects. 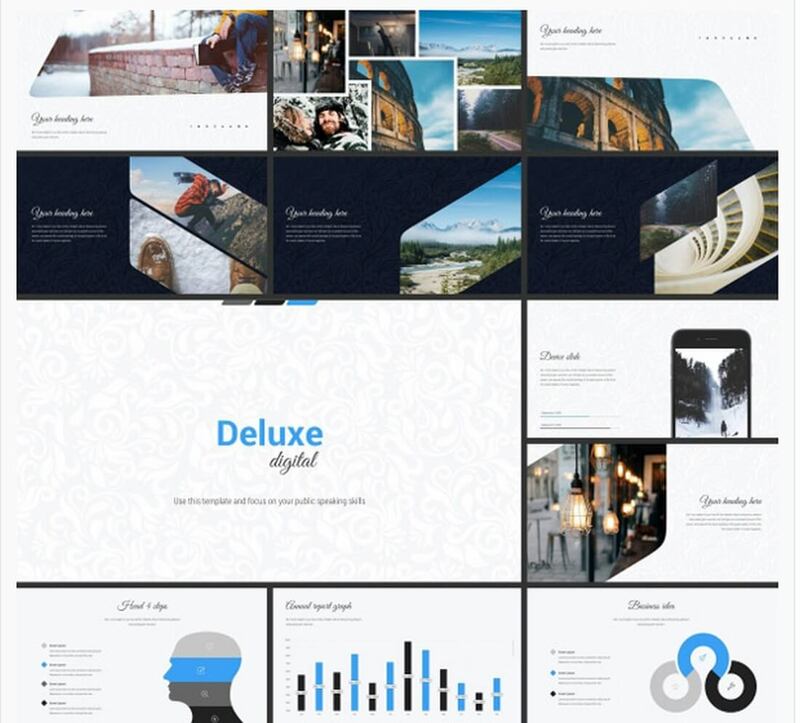 It comes with 30 unique slides in 5 different color themes and it includes a unique infographic, lots of illustrations, and a portfolio slide. 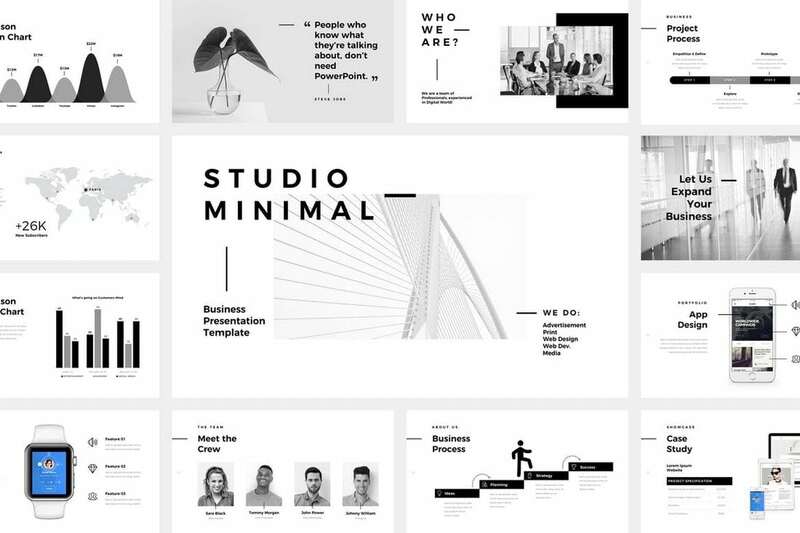 Studio is a minimalist Keynote presentation template that features a clean and a B&W design. 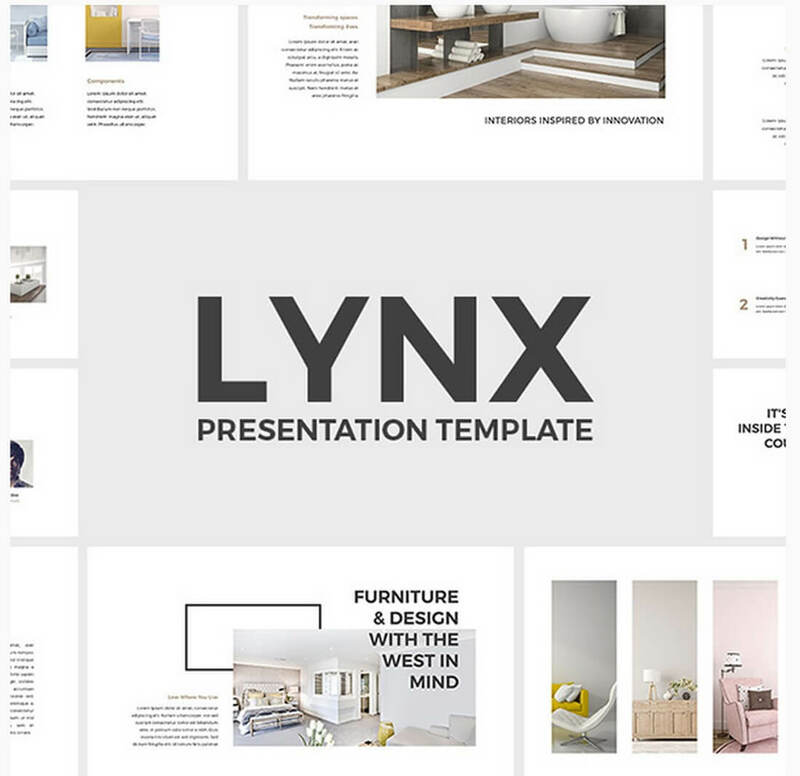 This template is perfect for presenting design projects and creating presentations related to creative agencies. The template includes 120 unique slides and comes in both animated and non-animated versions. 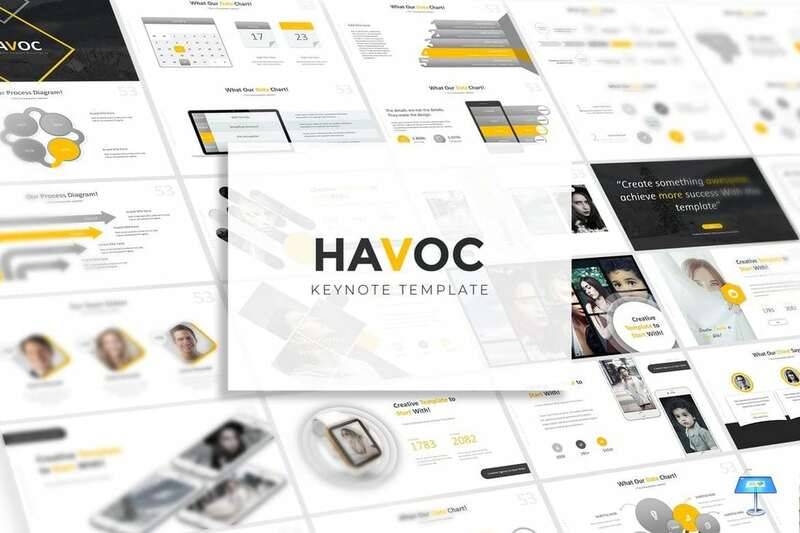 Havoc is a Keynote template made specifically for creating marketing and promotion related presentations. The template comes with a total of 150 slides featuring lots of vector graphics, illustrations, infographics, icons, charts, and more. 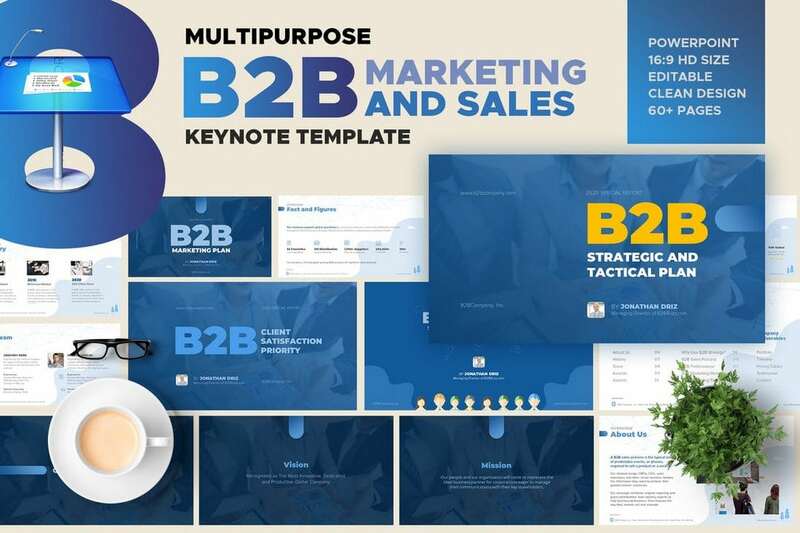 If you’re working on a B2B presentation, this Keynote template will come in handy. 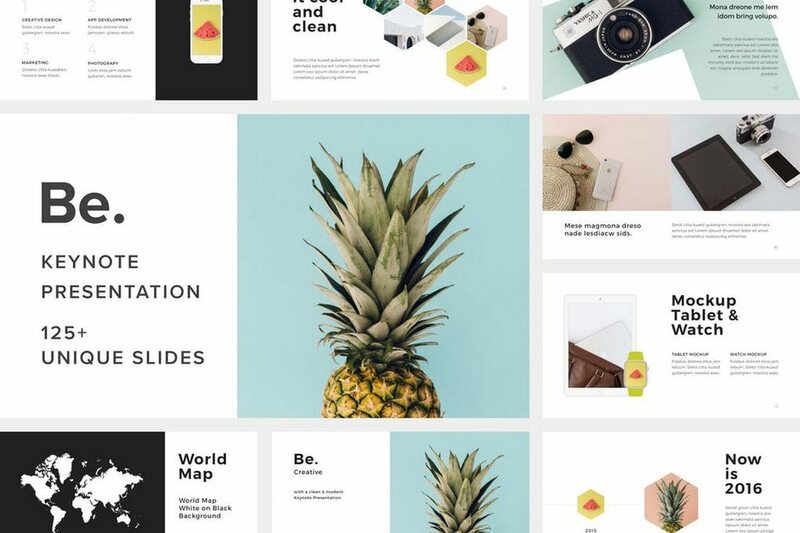 This template comes with more than 60 unique slides you can use to create B2B presentations for growth projections, meetings, and promotions. The template comes in 8 premade color schemes and you can easily edit the slides to your preference as well. Blockchain is a rising trend in technology and business. 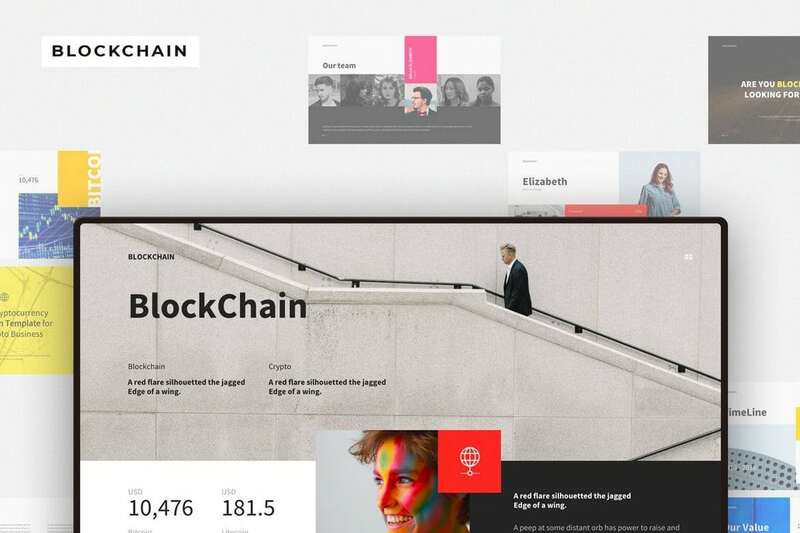 This unique Keynote template will help you create all kinds of presentation slideshows related to blockchain technology. It includes 150 beautifully designed slides featuring photo galleries, infographics, diagrams, and much more. 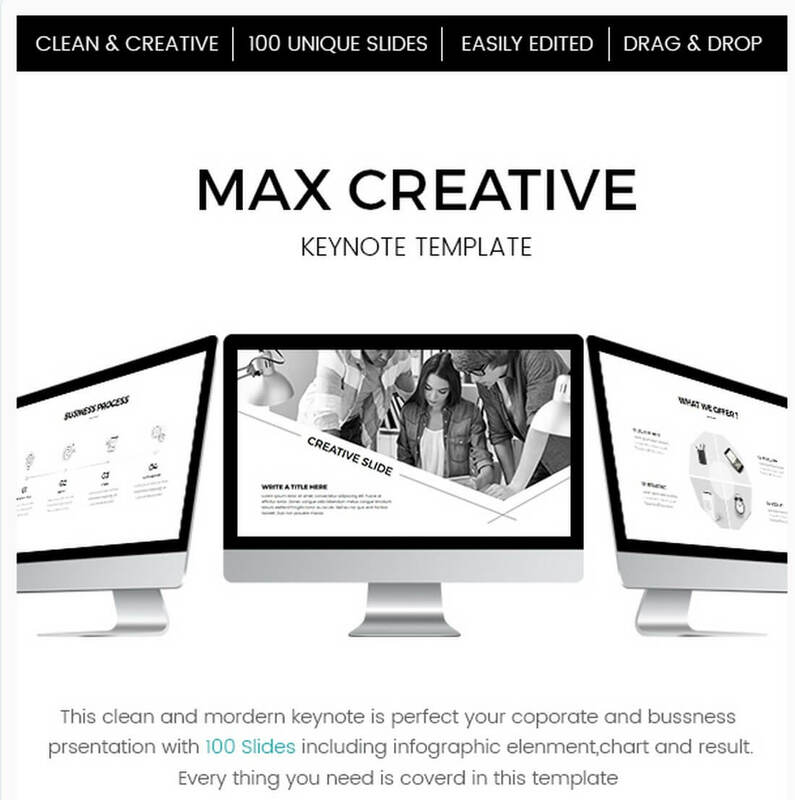 MaxPro is a professional Keynote presentation template made for creating slideshows for team meetings and other business-related presentations. It comes with 30 unique slides with clean and modern designs. The template is available in 9 different versions and in 5 different color themes. 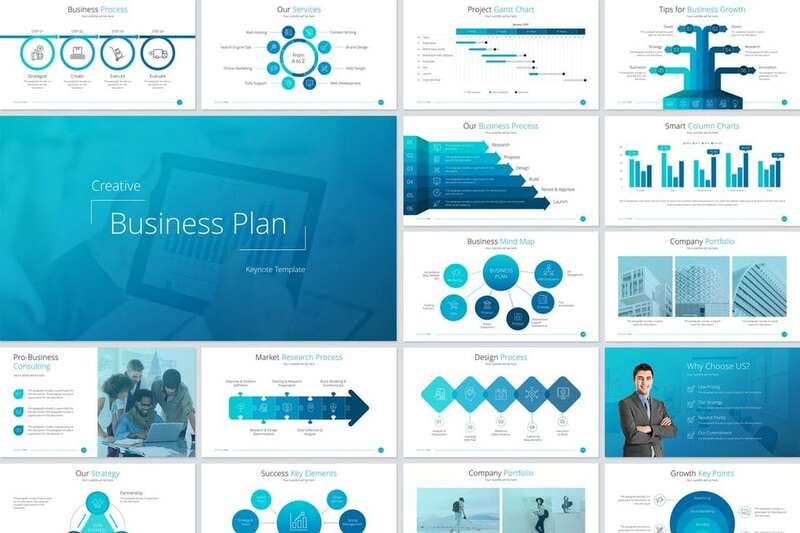 Just as the title suggests, this Keynote template features lots of slides that you can use to create attractive presentations to showcase your business plans of all kinds. It comes with 70 unique slides featuring problem and solution slides, marketing plans, projection slides, and much more. 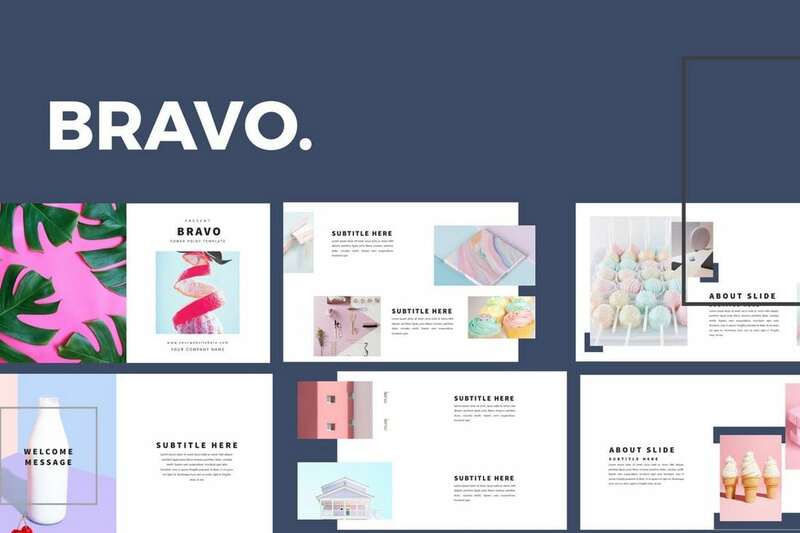 Bravo is a modern and elegant Keynote presentation that comes with a creative design. 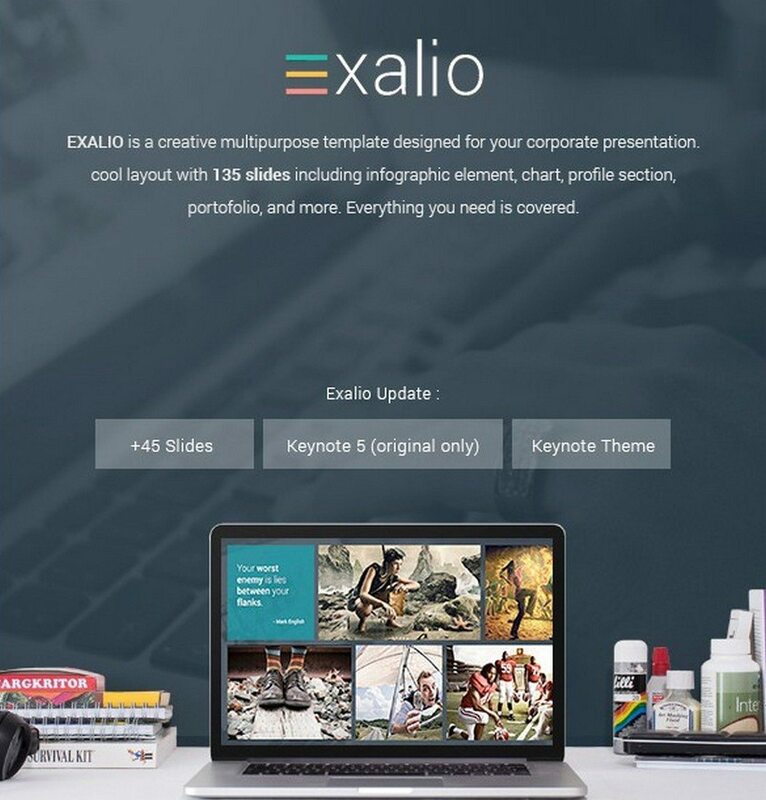 It’s perfect for making presentations for design agencies, visual brands, and fashion brands. The template includes 50 unique slides with easily customizable colors. 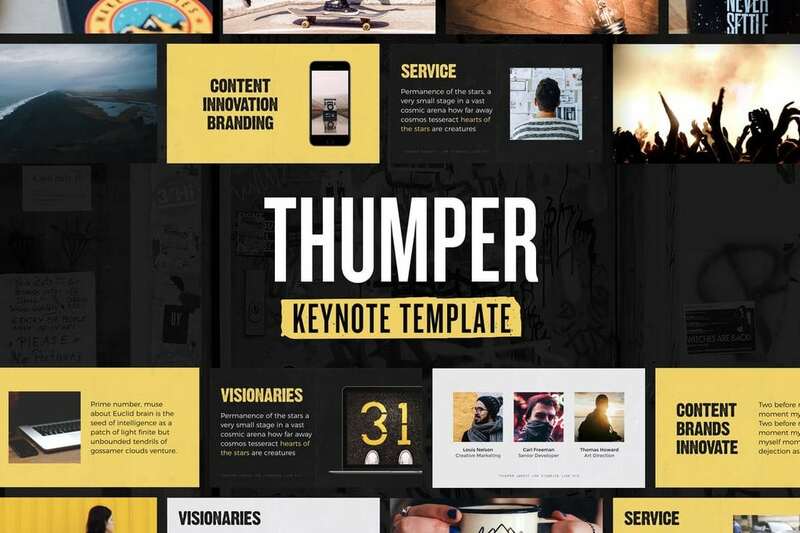 Thumper is a modern Keynote presentation template that comes with more than 100 unique slides. 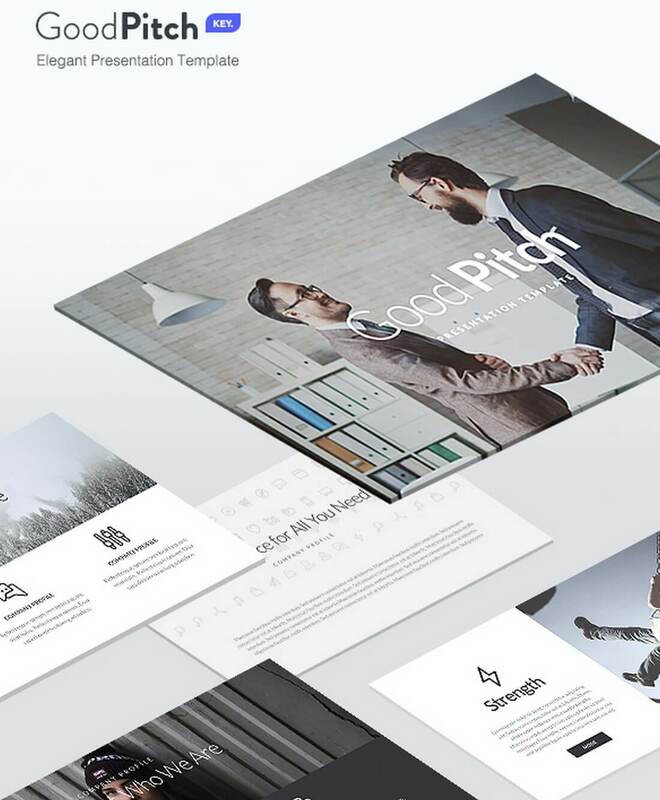 The template features lots of multipurpose slides that you can use to create marketing, business, creative, and many other types of presentations. 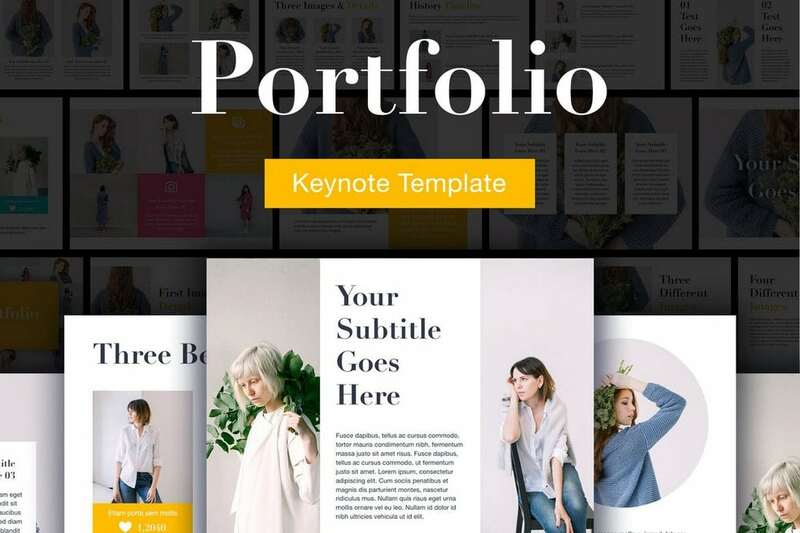 This Keynote template is designed specifically for designers, artists, and creatives for making presentations to showcase their portfolio. The template comes with 20 master slides in 2 different sizes filled with lots of visual elements, vector graphics, icons, and much more. 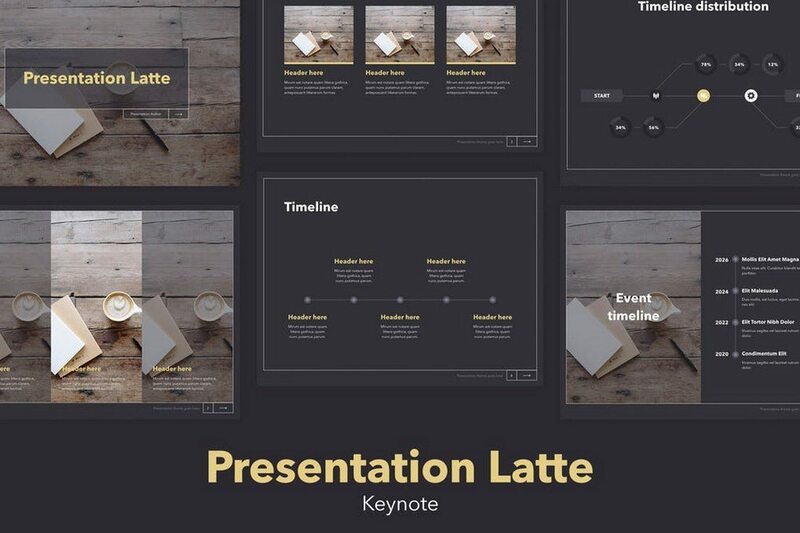 If you’re creating a presentation for a startup or an agency to pitch a product or an idea, this template is the best Keynote template you can use for that job. 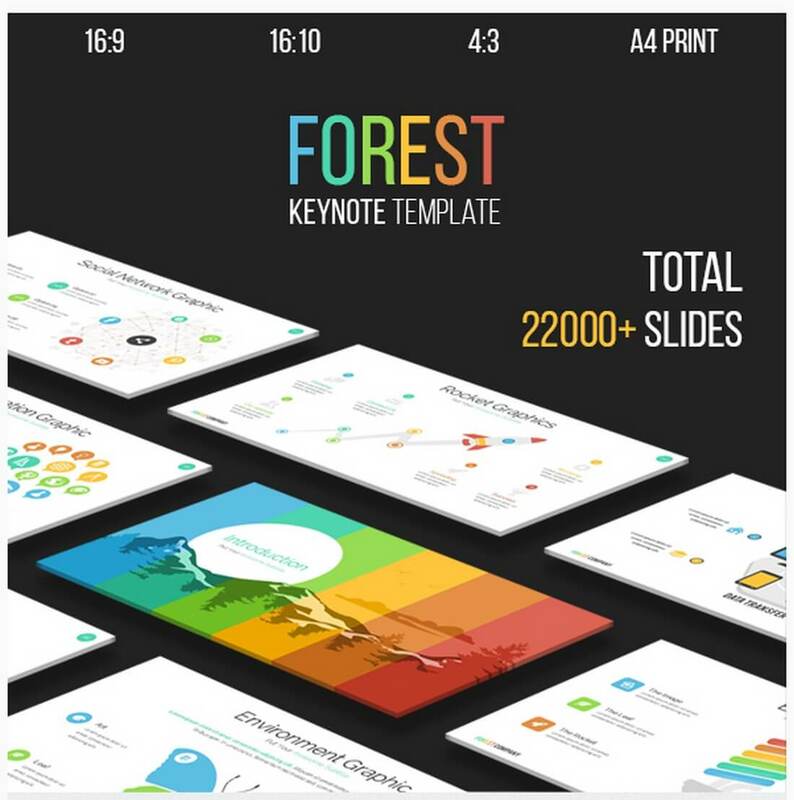 With more than 150 unique slides, this Keynote file comes in 10 variations of the template in light and dark color themes. 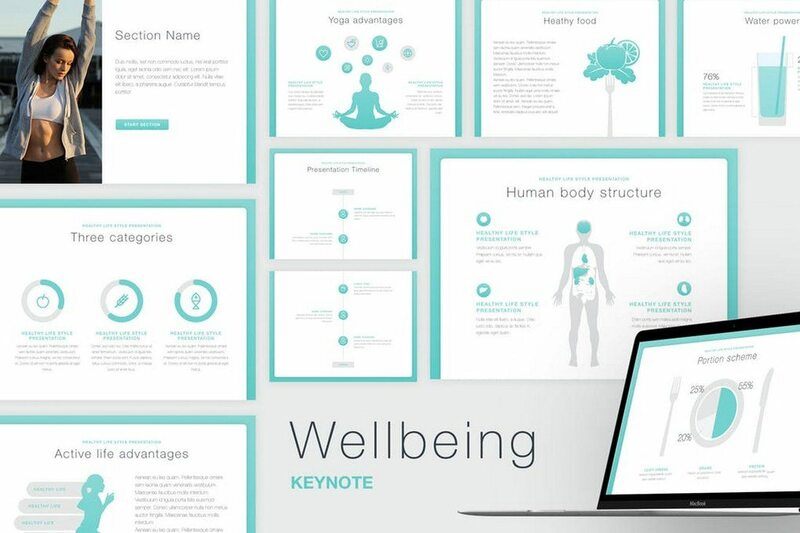 This template is ideal for a health or environment-related businesses to create engaging presentations to get your message across to everyone. It’s available in both standard and widescreen slide sizes. 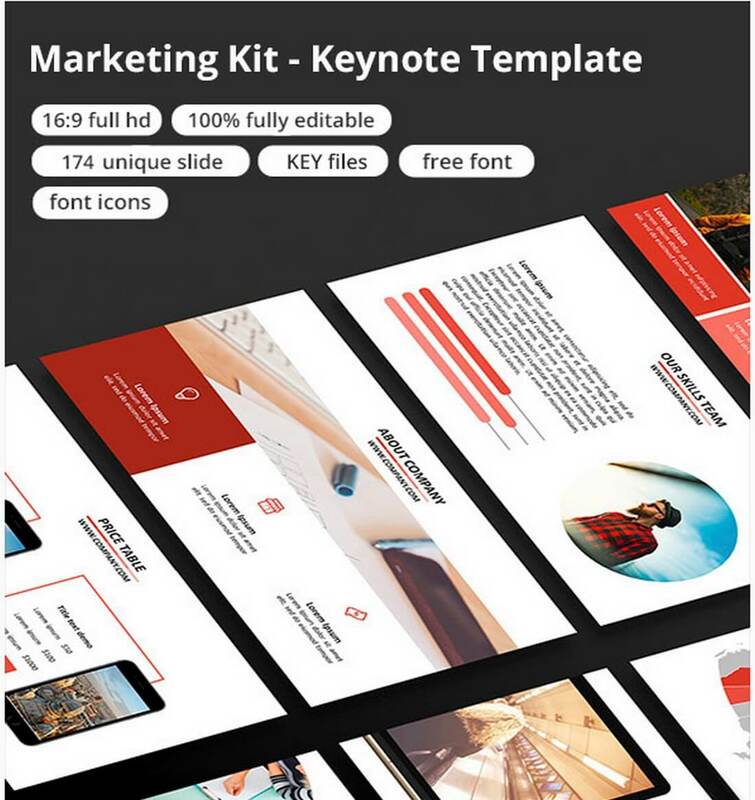 Dukku is a professionally designed Keynote template that features a design that’s ideal for advertising-related presentations. It comes in both light and dark color versions and includes charts, graphs, infographics, and more. This minimalist Keynote template comes with 80 unique slides that are perfect for creating presentations for many types of businesses. It also includes 28 icon slides, diagrams, infographics, illustrations, and more. 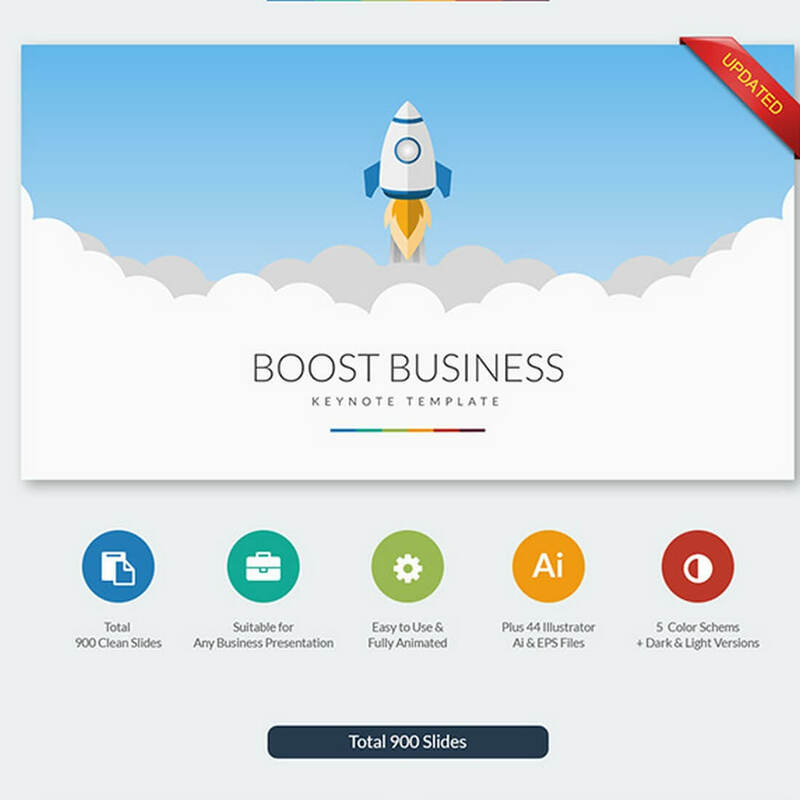 Munch is a Keynote template that’s best for creating presentations for marketing agencies. In addition to the brilliant color use, this template also features a minimal design that captures attention. The template also features easy to use image placeholders, graphs, illustrations, and editable charts. 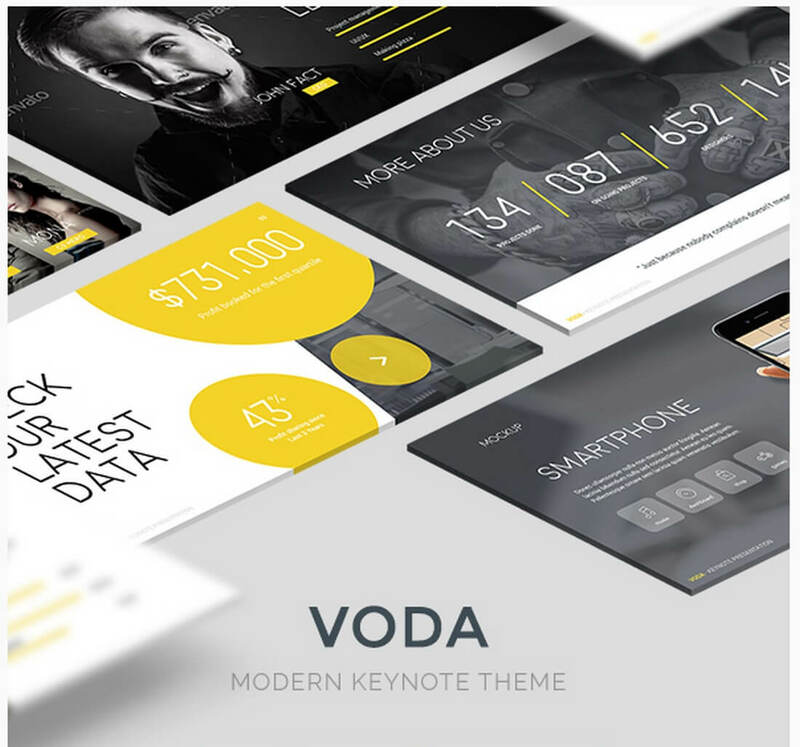 A colorful and modern Keynote template best for promoting web and graphic design related businesses. This template includes 35 unique slides with both light and dark themes and plenty of different color schemes. 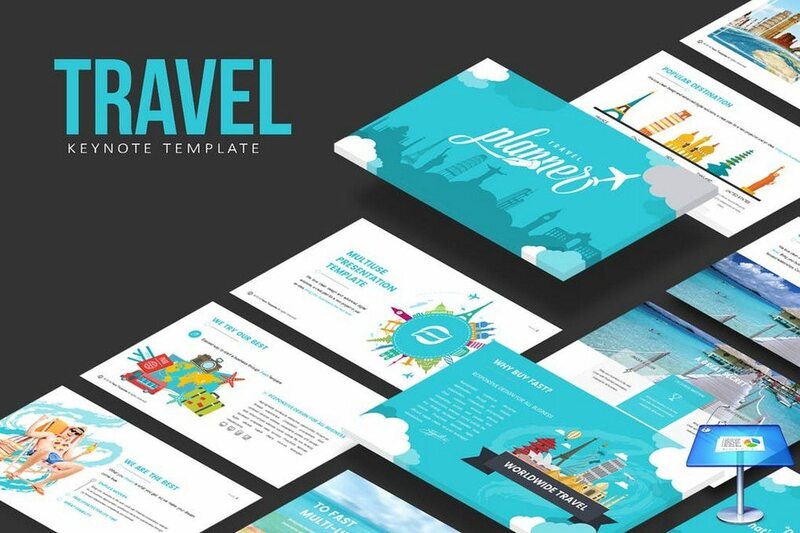 The perfect template for creating a presentation for a travel agency or a travel-related product. 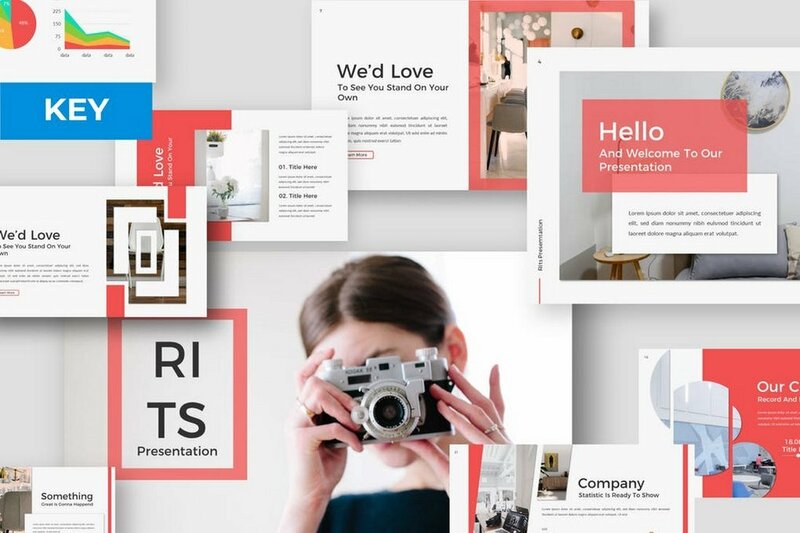 This Keynote template features 30 unique slides in 5 color variations. The dark color theme of this Keynote template makes it perfect for creating presentations for promoting high-end products and luxury businesses. It includes 20 unique slides in 2 different sizes. Be. 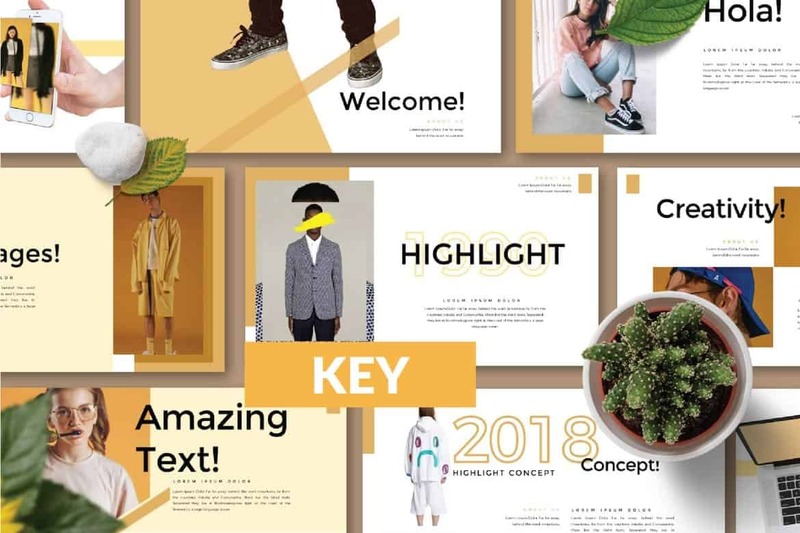 is an attractive Keynote template that allows you to create presentations using lots of images to better highlight your message and products. 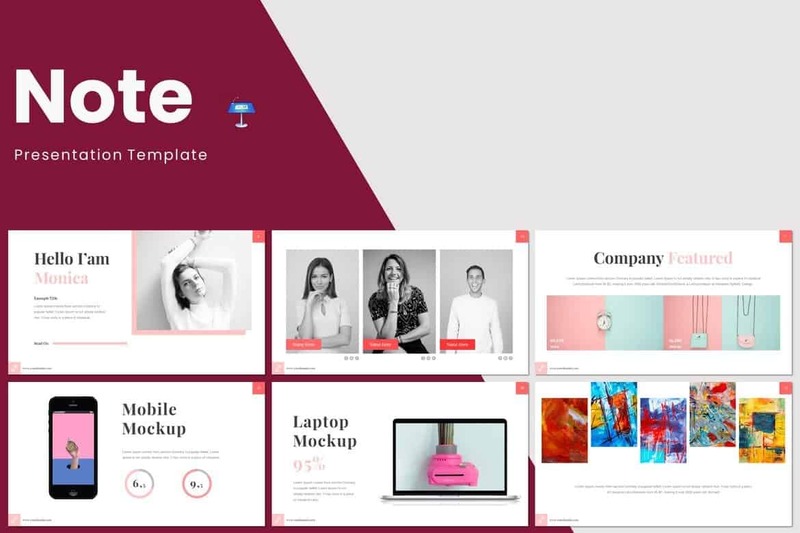 The template includes over 125 unique slides and drag and drop image replacements. This colorful template features a modern design that’s suitable for creating presentations and slideshows for many different occasions. It comes with 70 unique slides in HD resolution featuring lots of graphics, charts, graphs, and elements. A bright and colorful Keynote template for creating growth projections and other business-related presentations. This template 20 unique slides with easily editable high-resolution slides. 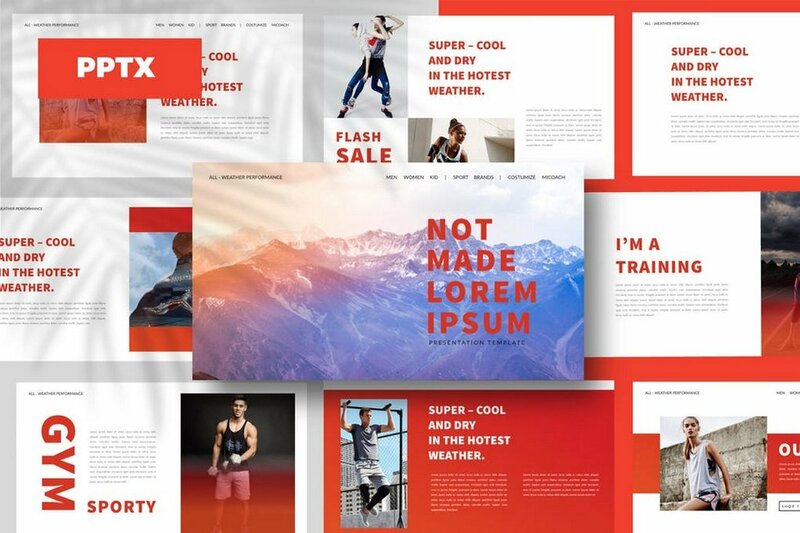 If you’re looking to create a slideshow for a fitness, yoga, or other health and wellbeing related business, this template will come in handy. It includes 20 slides that you can easily customize to your preference. 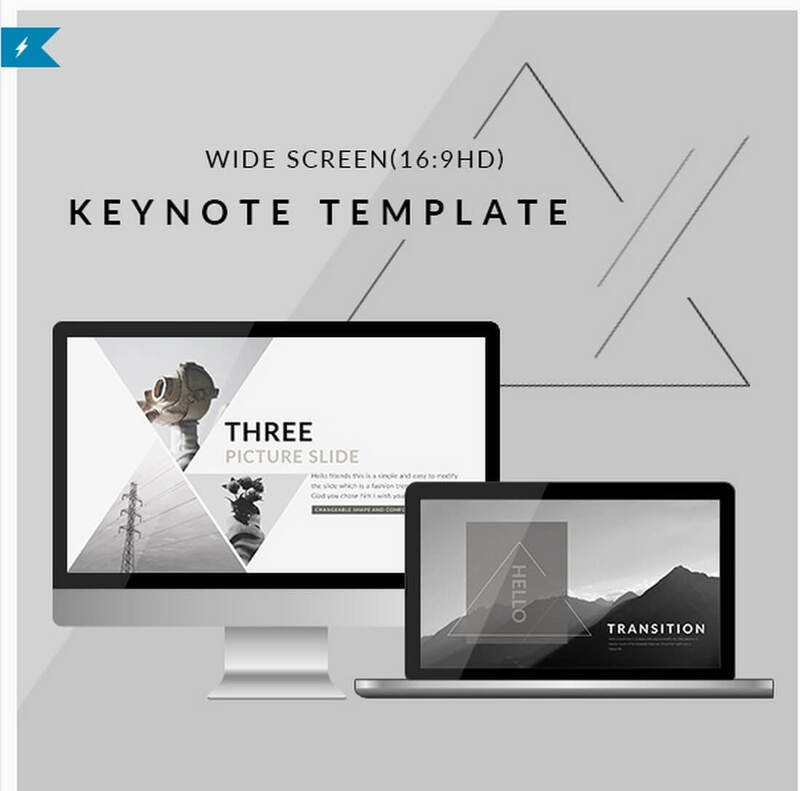 A creative and a highly professional Keynote template that comes to you in 5 different color variations. This template features 30 unique slides with a custom infographic, device mockups, and plenty of other graphics. Yet another minimalist, and stylish, Keynote template that comes with over 200 unique slides divided into categories, more than 3,000 vector icons, mockups, and much more. A stunning Keynote template featuring over 75 unique slides and a set of 500 font icons. 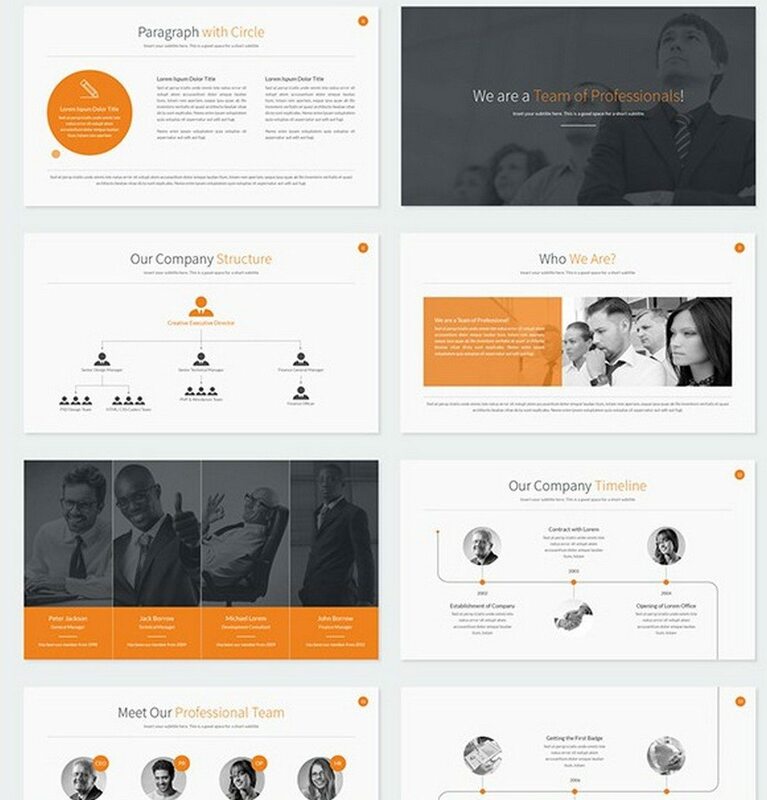 This template is ideal for designing presentations for creative agencies. If you’re designing a presentation with minimalist slides, this template will come in handy. The fully editable slides in this Keynote template feature a minimalist design with fewer colors and it comes with over 500 vector and font icons. 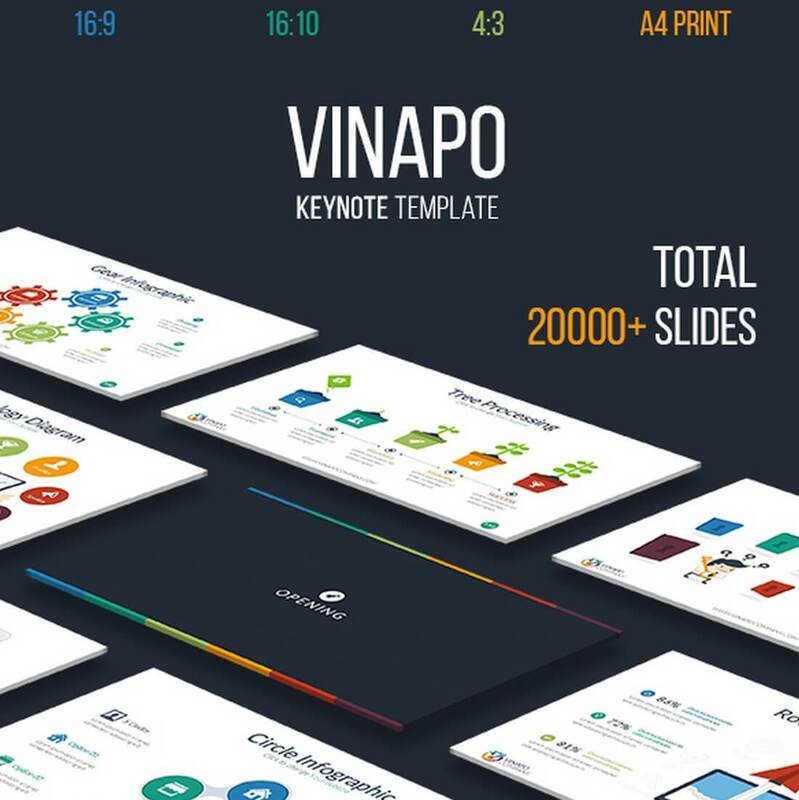 This massive Keynote template comes with a total of over 25000 slides in 16 different color schemes. 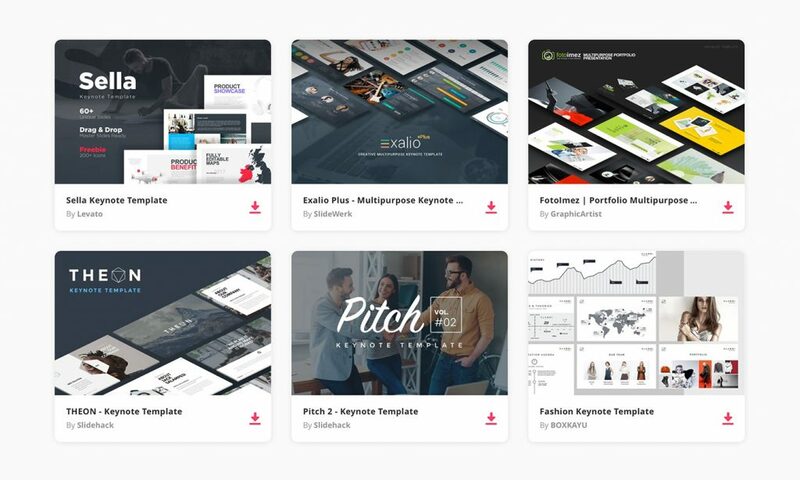 The template also includes a pack of 3000 vector icons, drag-and-drop editing, and a whole bunch of unique slides for presenting your business in different ways. The minimalist slides in this Keynote template also come with stunning animations. 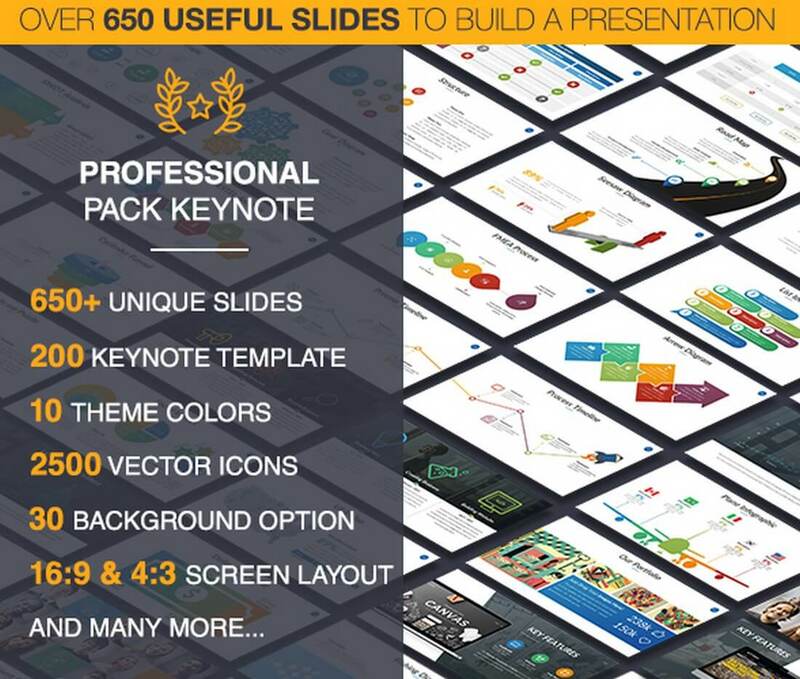 It includes more than 100 unique slides that are ideal for creating startups, products, and app presentations. 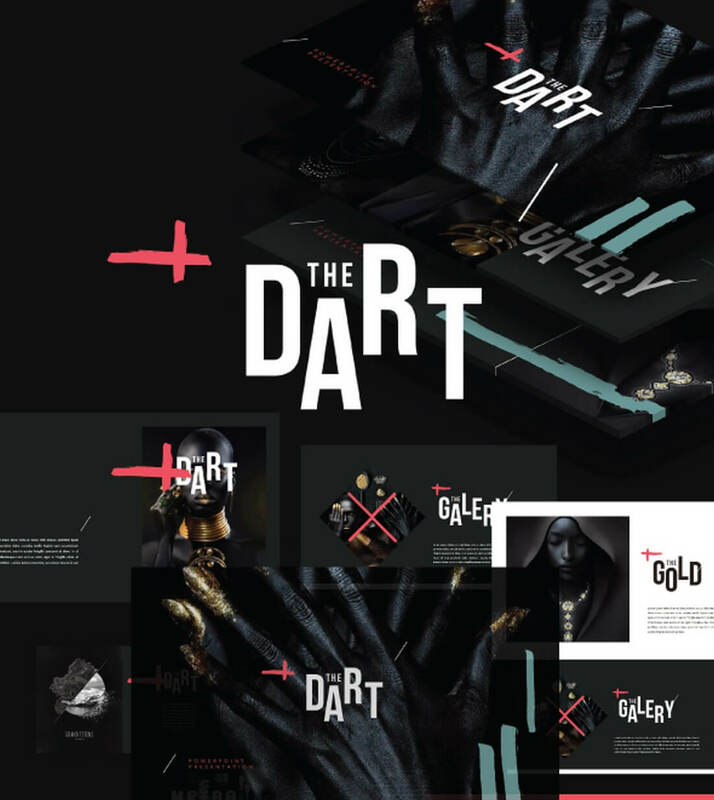 This template uses a darker theme and a unique design featuring the perfect colors for a marketing related presentation. 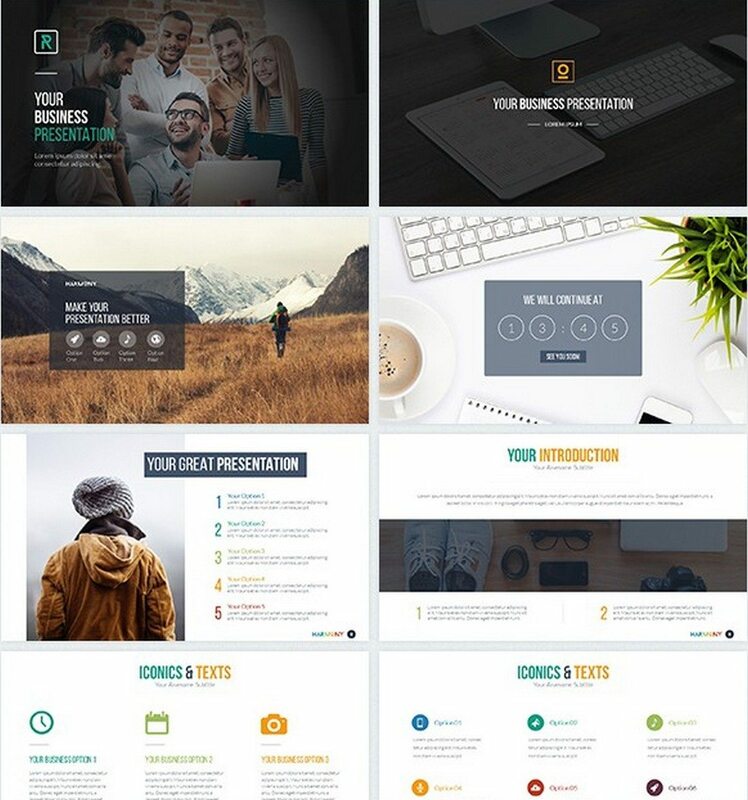 The template includes 50 unique slides in 5 themes. 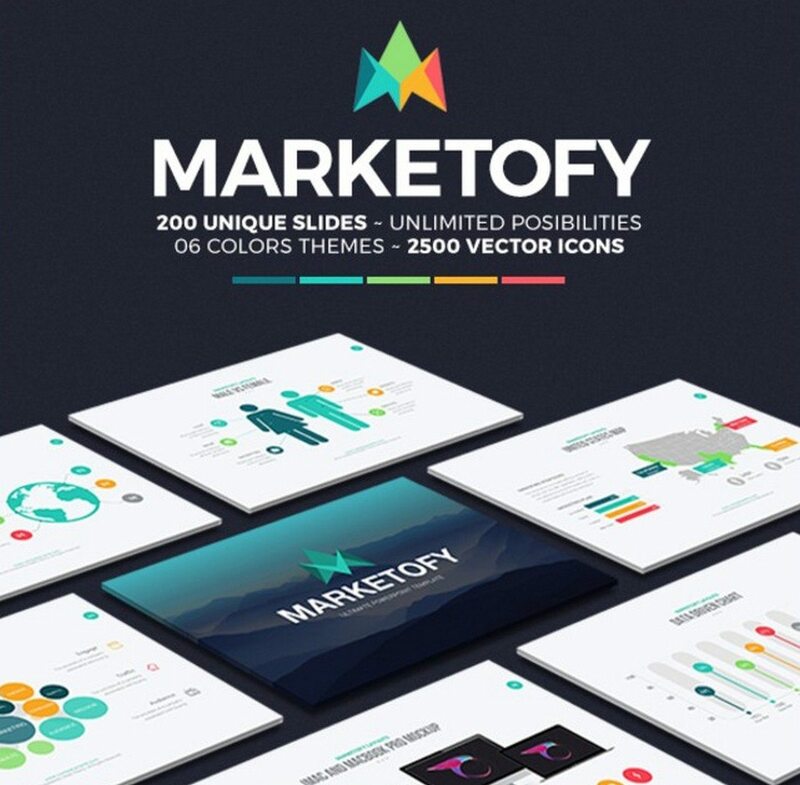 Marketofy is the ideal Keynote template marketers can use to create marketing campaigns, promotions, and business projection presentations. This template includes 200 unique slides in 6 different color schemes. 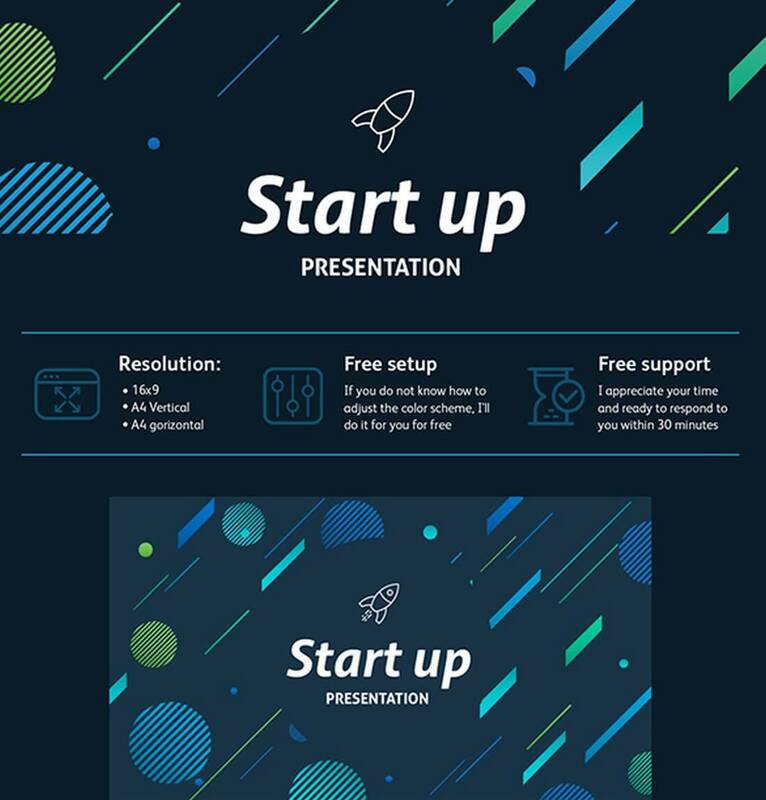 This is a multi-purpose Keynote template that’s suitable for presentations related to both startups and corporate businesses. It comes with 135 unique slides featuring graphs, charts, infographics, and much more. If you’re planning a presentation for a business proposal, this Keynote template will come in handy. The template comes with a total of 4000 slides in 10 different color schemes and in HD resolution. 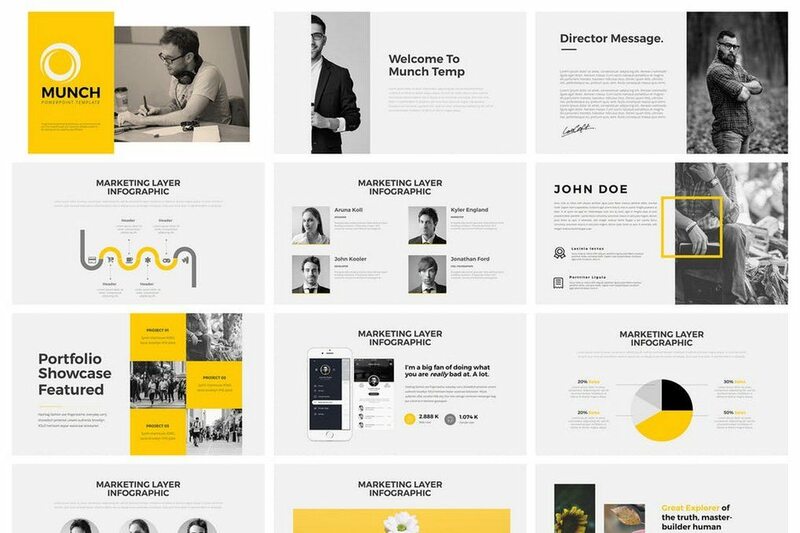 Harmony is a Keynote template that features 200 unique slides with a modern and a clean design. The slides are also available in 20 different color schemes which also includes more than 3000 vector icons, charts, graphs, and much more. This template includes more than 260 unique slides in both dark and light color themes. The slides are also fully animated and come with drag-and-drop placeholders for easy editing. This modern Keynote template also features dark and light colored slides. It features more than 40 unique slides with animations and they are available in 4 different color themes. 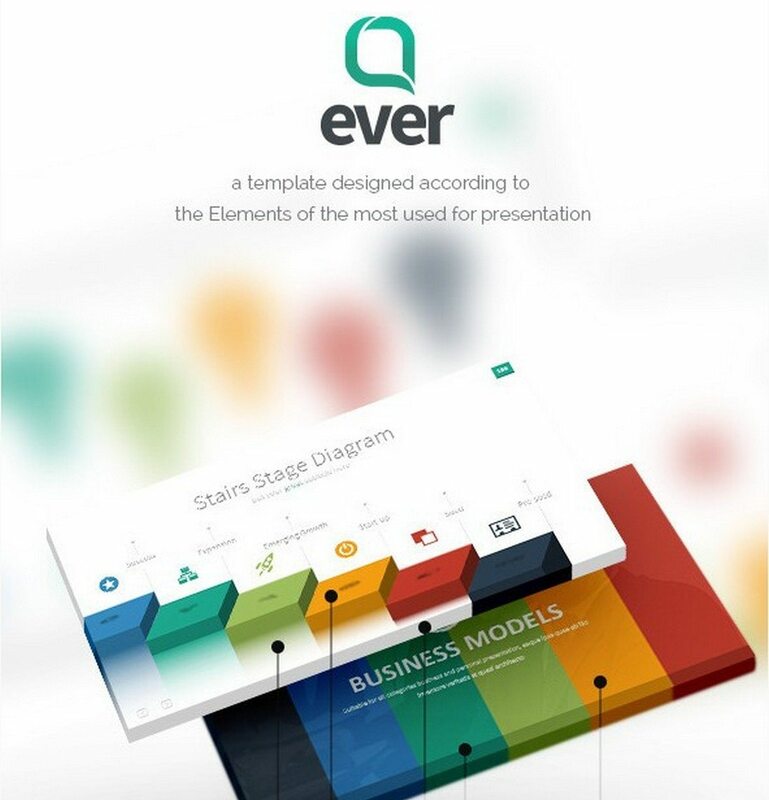 Ever is a Keynote template that’s been designed specifically for professionals. 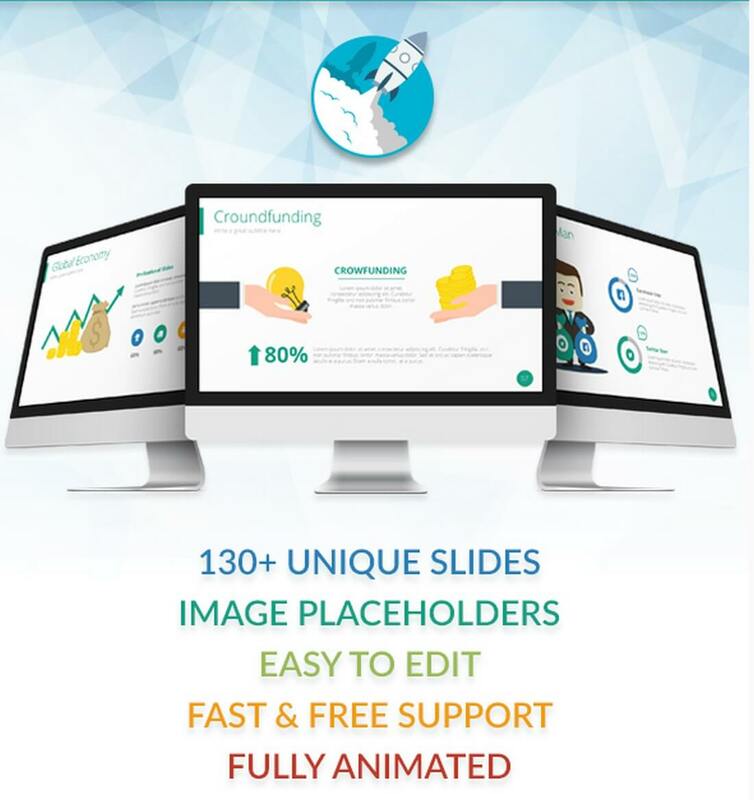 It features highly optimized slides for crafting effective presentations. The template also comes with a total of 16,000 slides with unlimited color options. 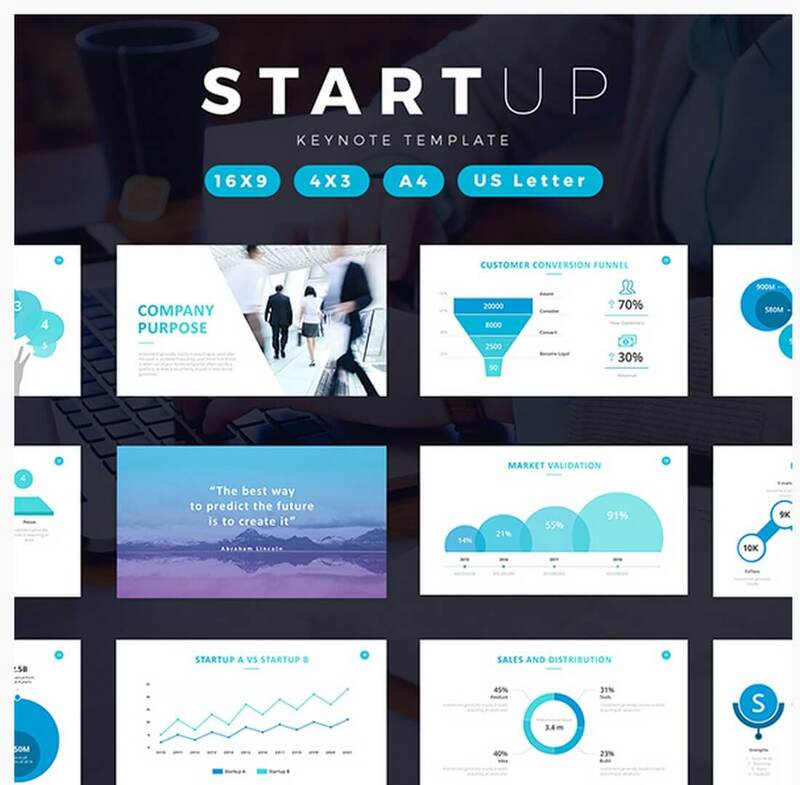 This Keynote template is perfect for creating a presentation that showcases startups, agencies, and businesses. It includes a total of 2600 slides and comes in 10 different color schemes. 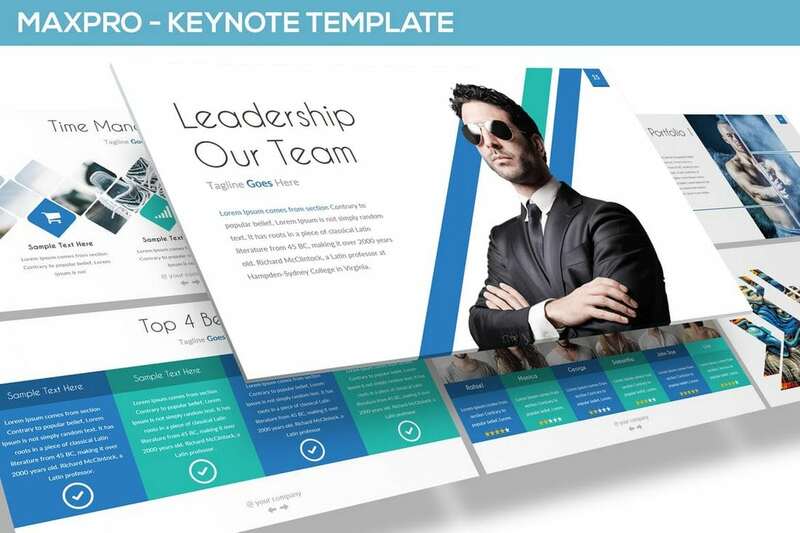 This template includes more than 4200 slides for creating presentations that highlight growth and projections. The slides in this template also feature graphs, infographics, charts, and much more as well. 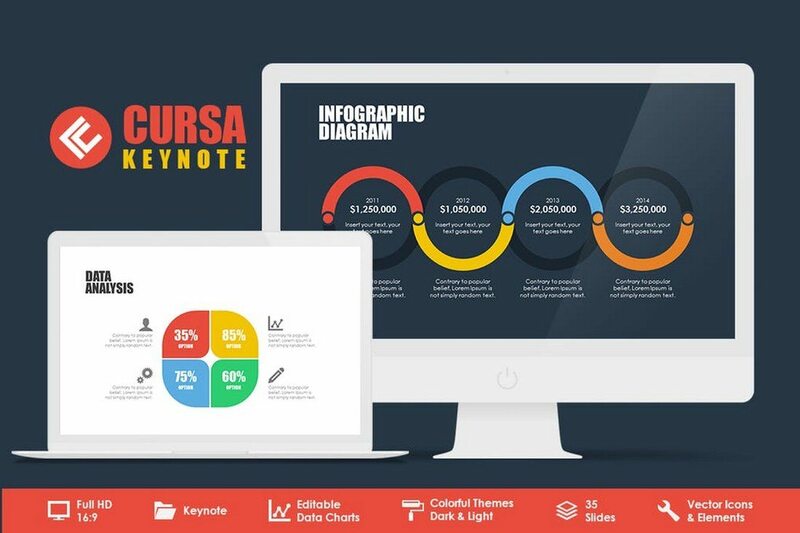 With more than 1500 slides in 7 different color schemes and featuring infographics, charts, and infographics, this Keynote template will allow you to create almost any type of business presentation with ease. 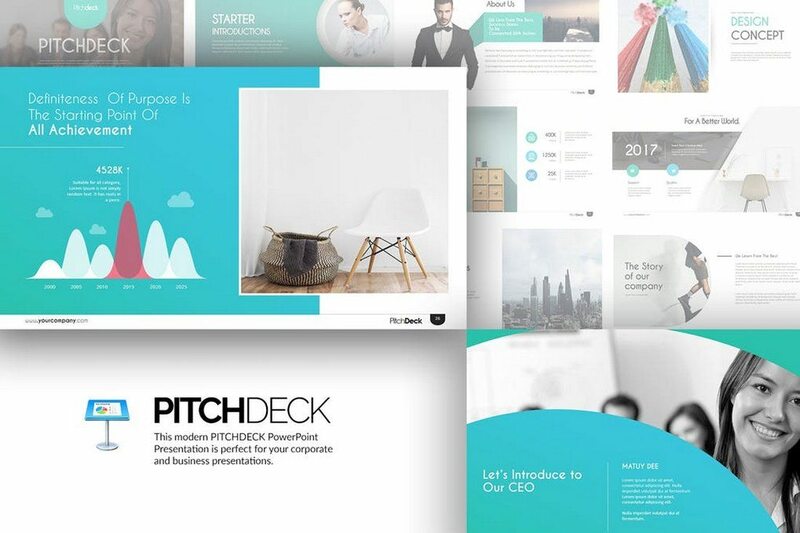 The ideal Keynote template for pitching or presenting your business ideas and concepts. This template comes with over 150 unique slides (total 15,000 slides) in various colors and themes. 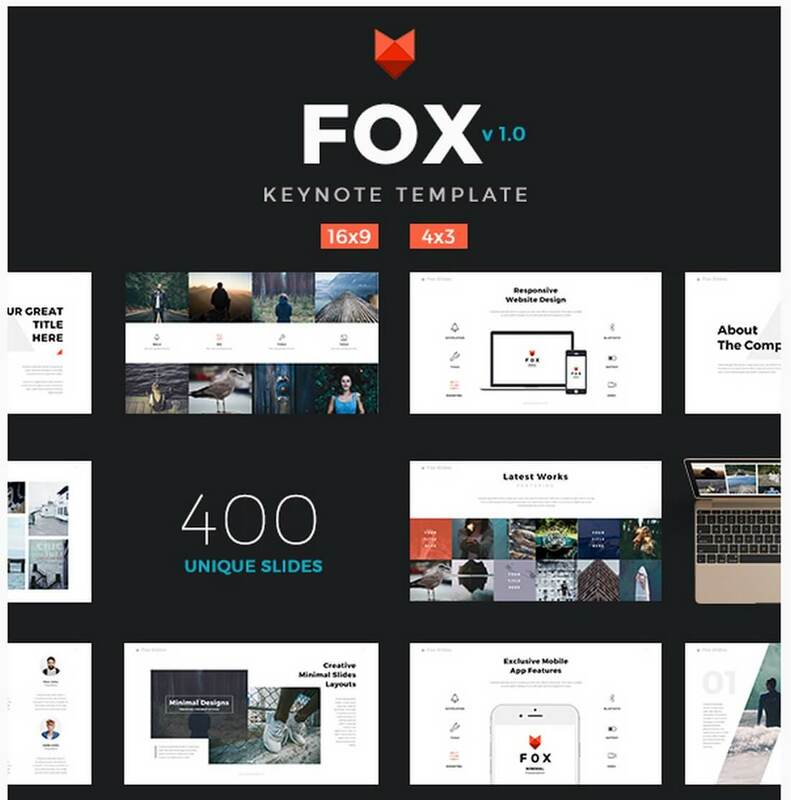 We’ll start the list with a massive pack of Keynote templates that includes 650 unique slides in 20 different categories and styles and 10 color themes that are suitable for various types of presentations. 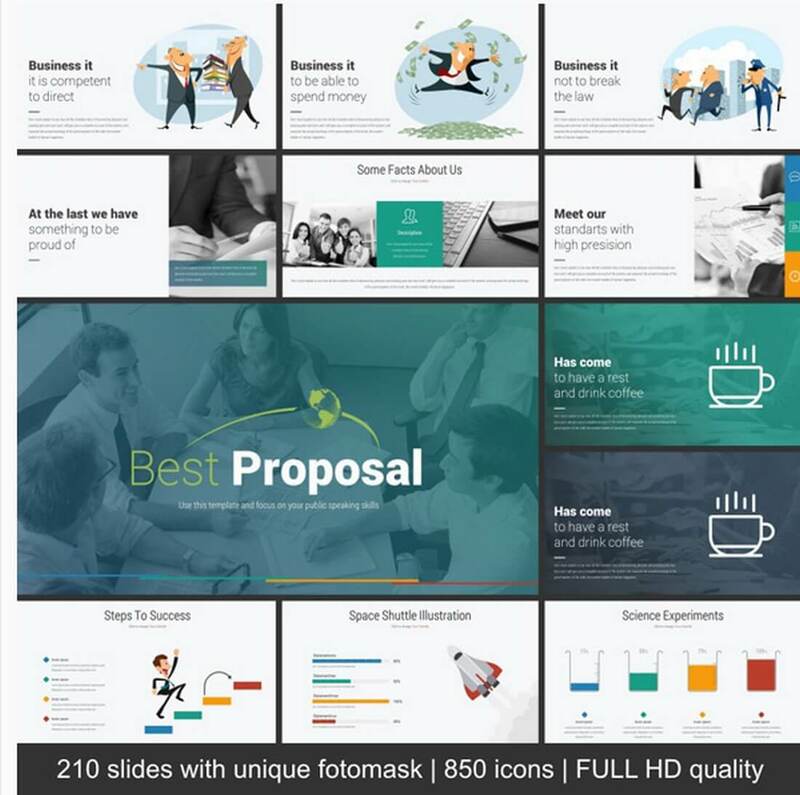 With 200 beautiful slides in 8 different themes (total 1500 slides) this Keynote template is just what you need for crafting a great presentation for your business growth and projection meetings. 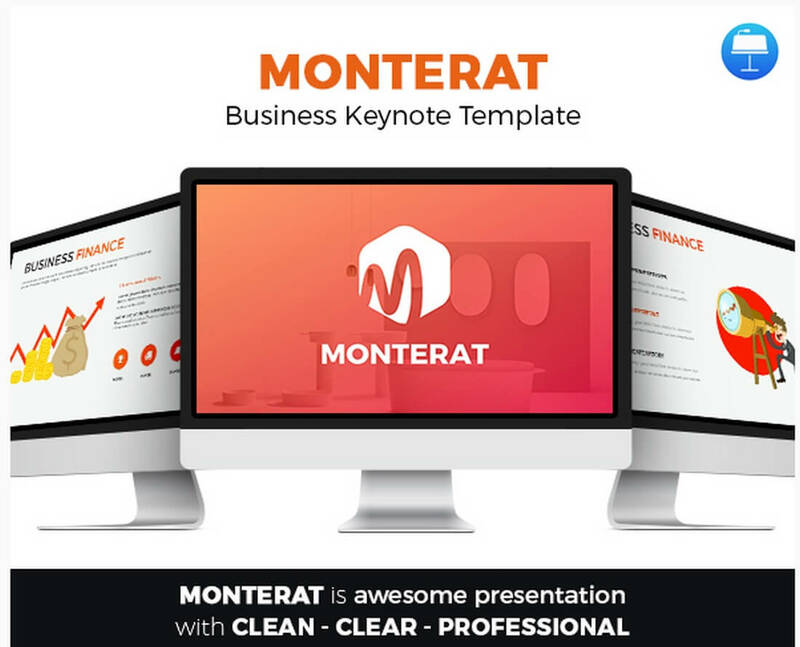 This is a multipurpose Keynote template that you can use with both business and personal needs. It comes with over 200 unique slides in 24 themes and in 4 aspect ratios. 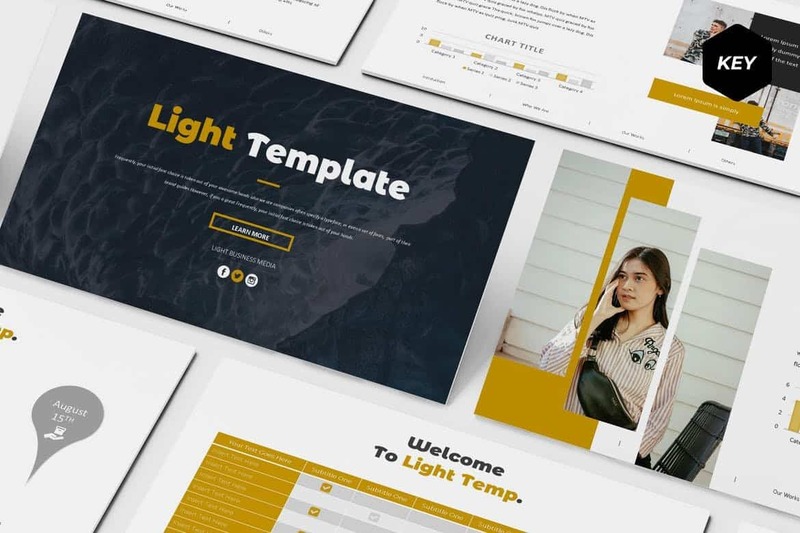 This template comes with over 600 slides in light and dark themes, along with 500 vector line icons, vector maps, and more. Best for pitching startups and agencies. A colorful and a beautiful Keynote template that effectively use photography and icons to instantly grab anyone attention. The template includes 50 slides with charts and a world map. 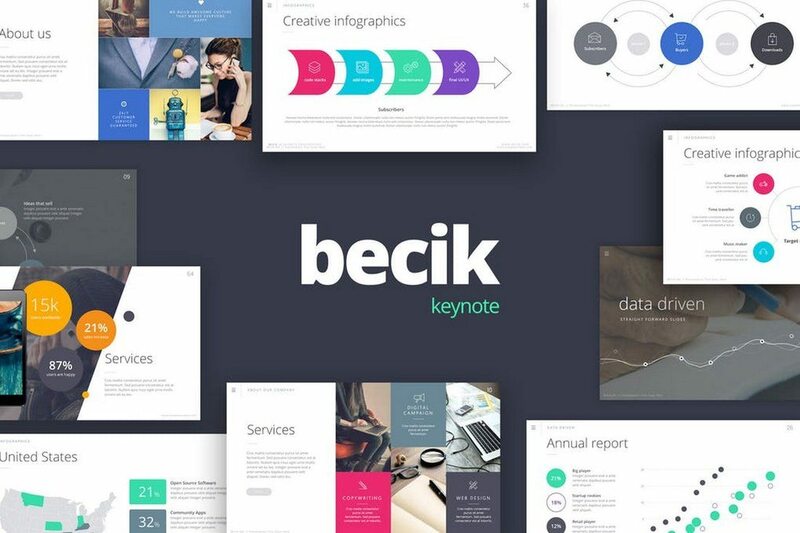 With 171 unique slides, 850 vector icons, and fully editable vector maps and infographics, this Keynote template provides you with all the necessary tools for crafting great slides for your next business presentation. 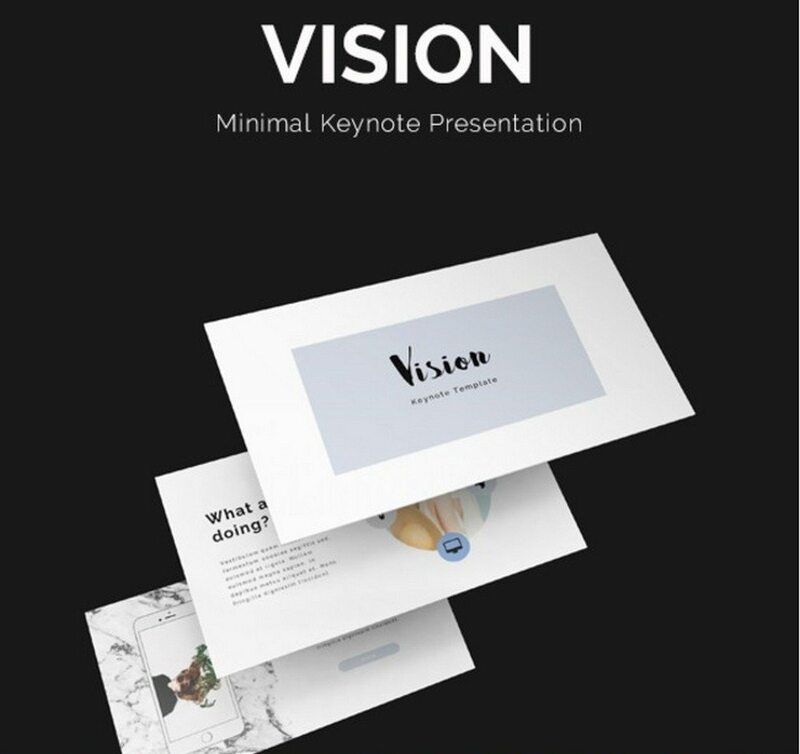 A creative Keynote template with an odd, yet a remarkably unique design that is guaranteed to catch anyone’s attention. It’s ideal for designing a presentation related to fashion. 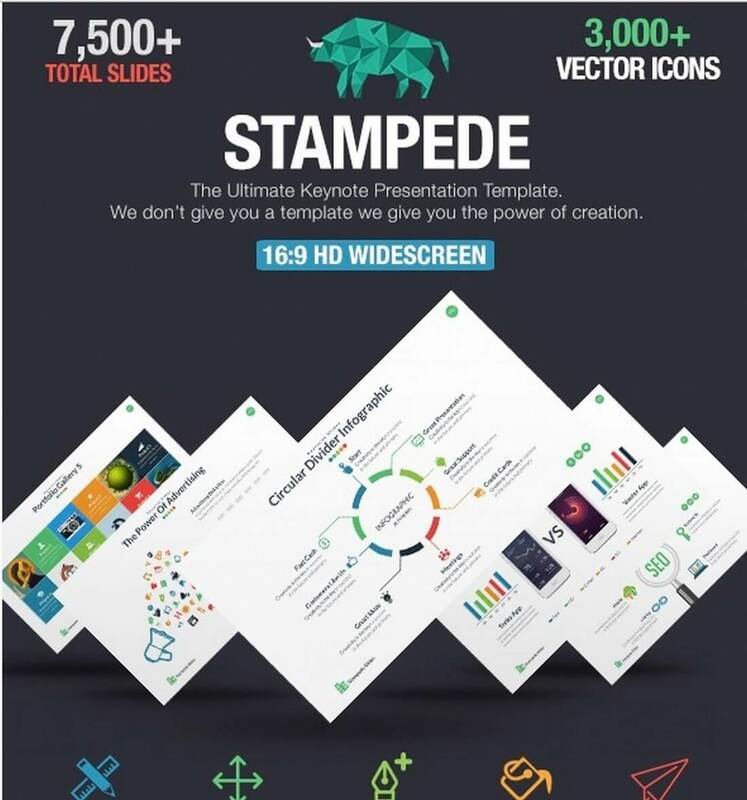 The 70 unique slides and 2500 vectors icons in this Keynote template will come in handy when designing a presentation to pitch your startup to investors. 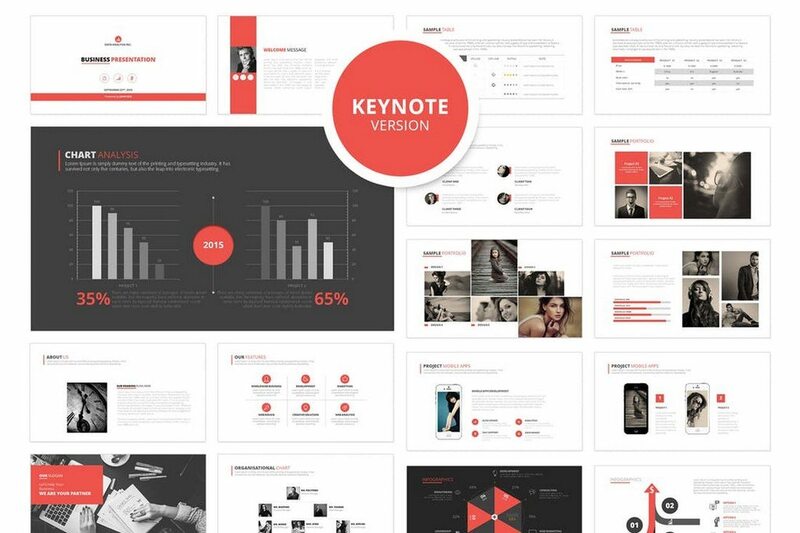 A professionally designed Keynote template with charts, infographics, mockups, and much more. It includes over 160 slides. Sketch is a unique Keynote template that features a design that makes its slides look like they were hand-drawn. It includes charts, growth maps, and much more. This template comes with 233 unique slides in 24 themes with resizable vector graphics and 3000 vector icons. 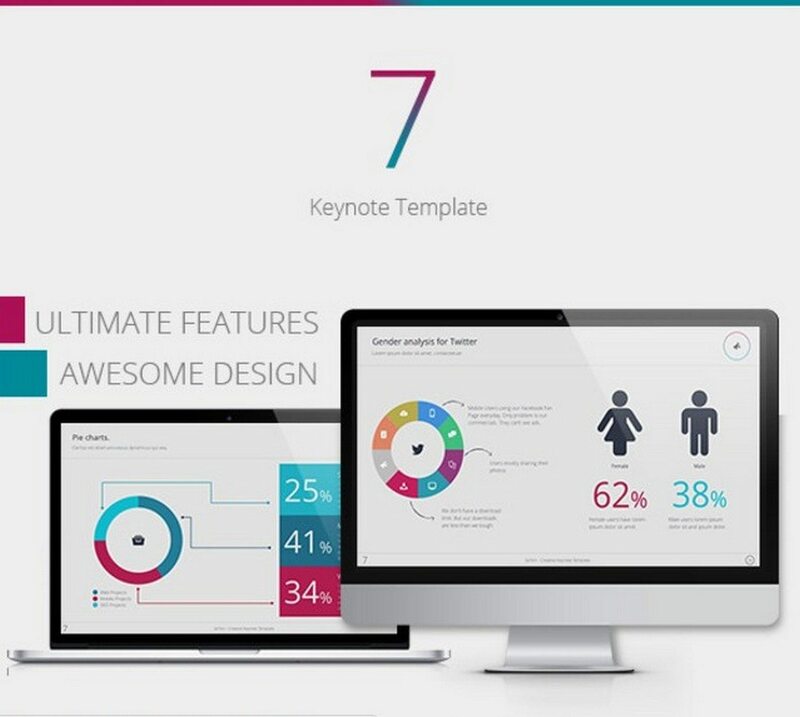 Se7en is a minimalist Keynote template designed for creative agencies and startups. 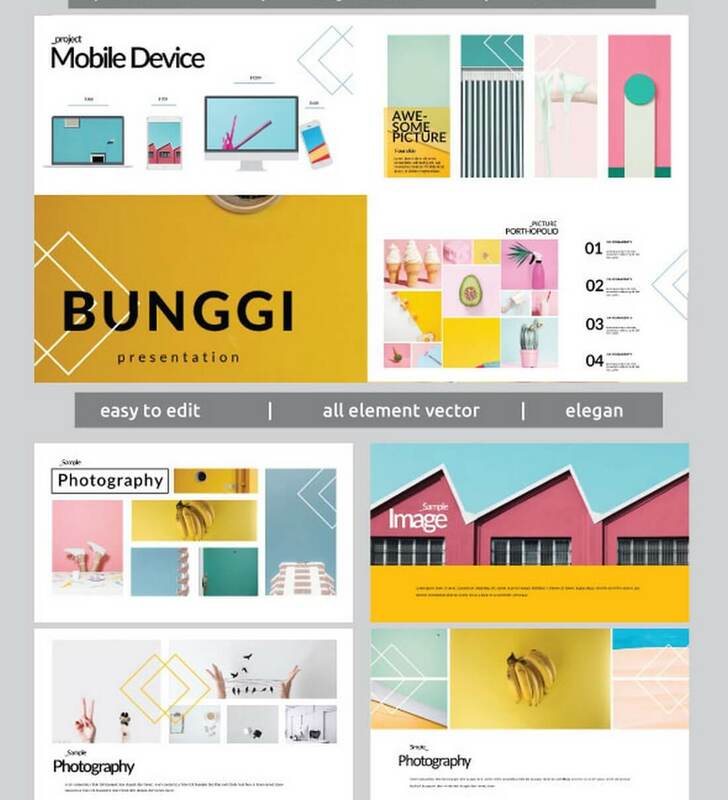 The template includes 100 unique slides featuring a variety of designs and elements such as maps, graphs, portfolios, and much more. There are more than 230 slides in total. The humorous illustrations featured in the slides is what makes this Keynote template so special. It’ll help you deliver your message in a fun way during your presentations. 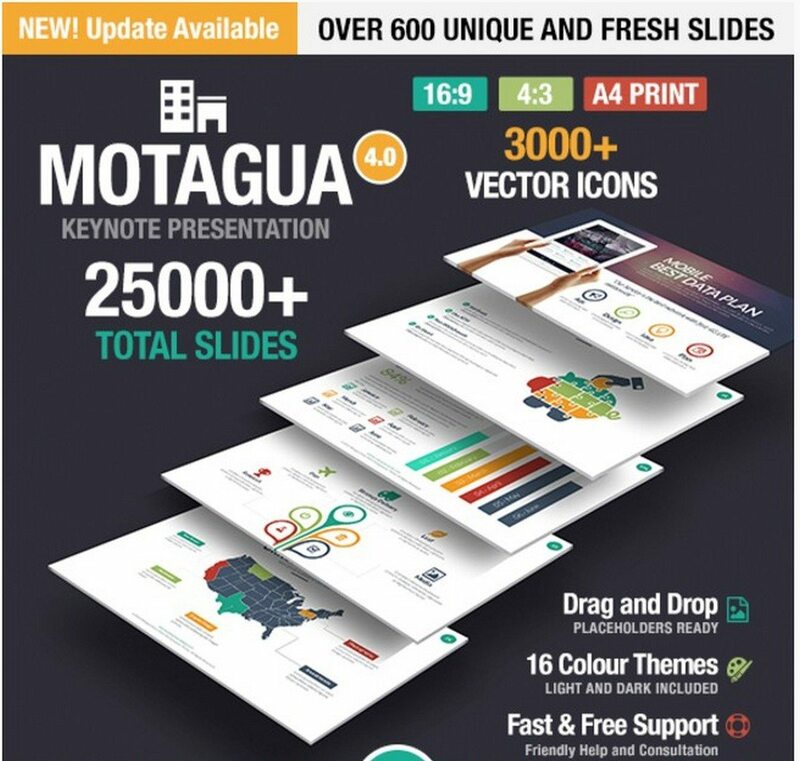 This massive template comes with over 7500 slides, including 370 unique slides in 10 color themes and over 3000 vector icons. A clean and minimal Keynote template that features 400 unique animated slides, over 2500 vector icons, editable vector graphics, and much more. 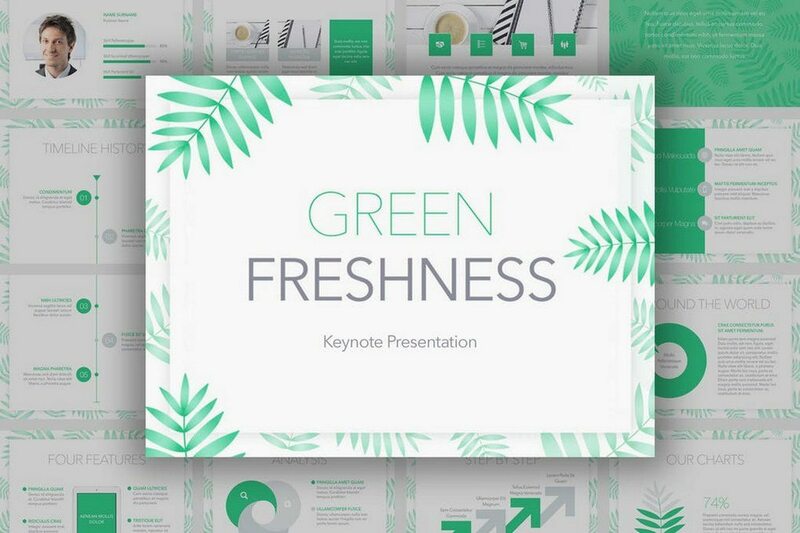 This modern and clean Keynote template uses only a few colors throughout its design. It’s perfect for a creative business or an agency. 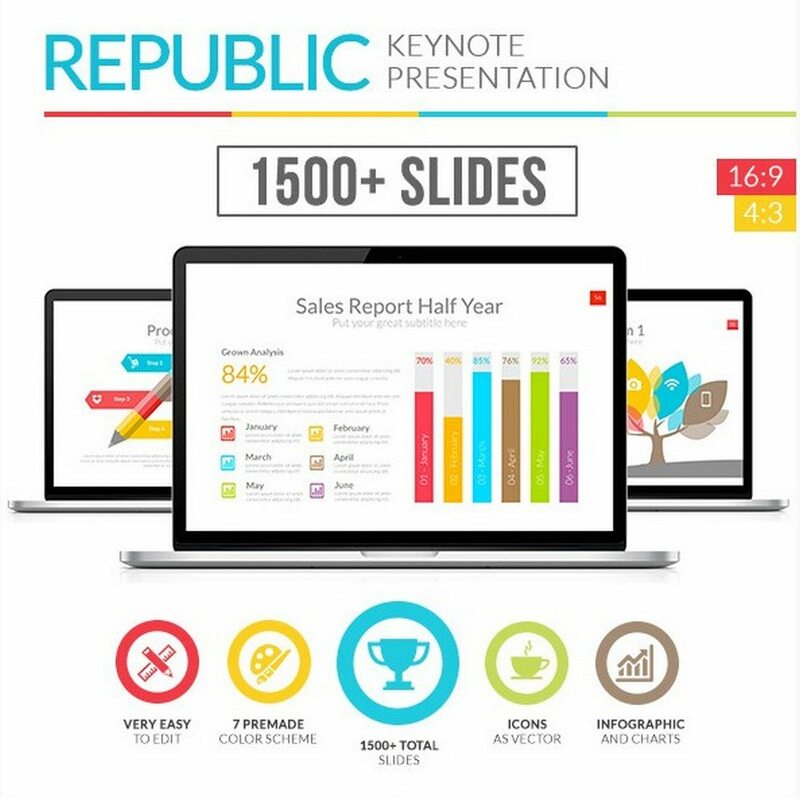 A Keynote template specially designed for marketing related presentations. This template comes with 174 professionally designed slides. 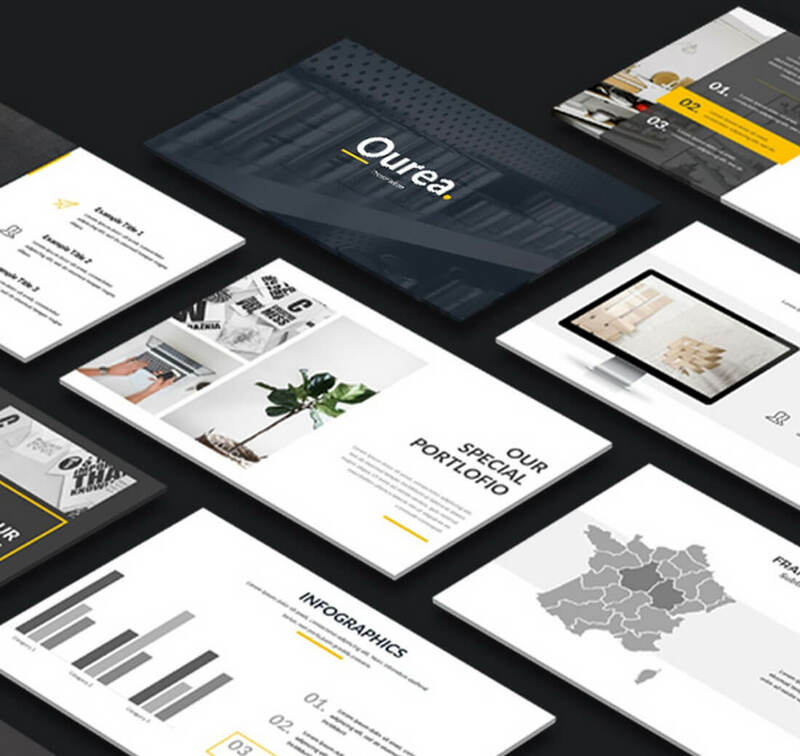 With a total of 900 slides in 5 color themes, including light and dark themes, this Keynote template comes with lots of graphics, charts, and infographics as well. 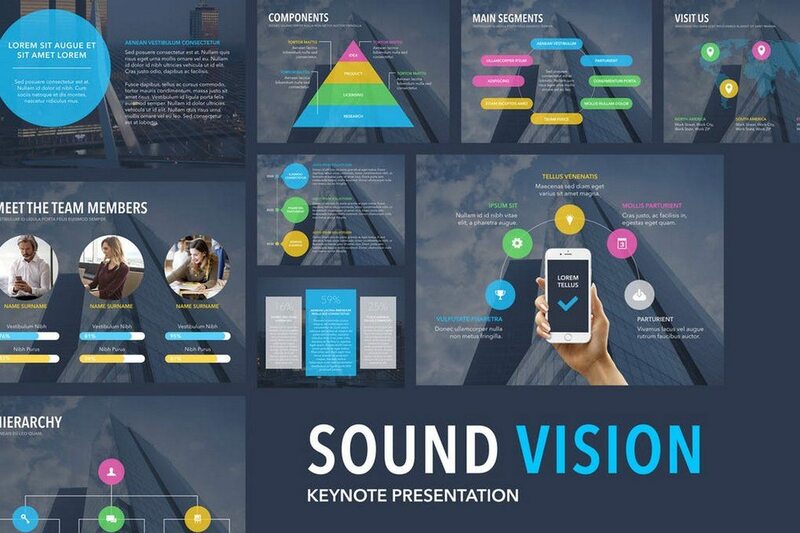 A professionally designed Keynote template with modern and stylish slides. This template comes with over 200 animated slides. This template is more suitable for home interior, furniture, and design related businesses. It comes with 100 unique slides with lots of photos and vector icons. Yet another attractive Keynote template with stylish illustrations that will make your entire presentation look more enjoyable. The template includes over 130 slides with beautiful graphics and illustrations. There are a lot of cupcakes in this template. But, that doesn’t necessarily mean this Keynote template is only suitable for a cupcake business. Replace the photos with your own photos and the template is yours. Although, it’s mostly suitable for a food related business. All of these Keynote templates are super-easy to edit. You can edit the designs, drag around to rearrange objects, change colors, and do a whole lot more to design your own unique Keynote presentations. Did you know that you can also export your Keynote presentations as Full HD Quicktime videos? Just go to File > Export To > and select QuickTime to save your entire presentation as a video. Or Play your presentation and press Record to record your presentation with a voiceover into a video file that you can play to an audience.